For events pre-July 2015, see Timeline of the war in Donbass (April–June 2015). For events post-September, see Timeline of the war in Donbass (October–December 2015). This is a timeline of the War in Donbass, from 1 July 2015 to 30 September 2015. 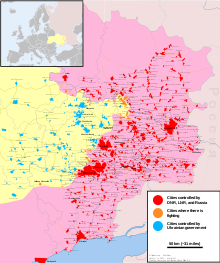 The timeline follows an ongoing conflict between Ukraine and anti-government pro-Russian separatists allegedly supported by Russian troops in the Donbass region in eastern Ukraine. According to military spokesman Andriy Lysenko one Ukrainian soldier was killed in action and other ten wounded during the last 24 hours in the Donbass region. All the casualties occurred around Donetsk city. During the same period, the militias launched 53 attacks on Ukrainian troops. The area of Mariupol continued to be the epicenter of the action, with multiple-weapons strikes on Shyrokyne and 122 mm artillery and "Grad-p" rocket fire on Berdyansk. The Ukrainian artillery retaliated on several occasions. Converserly, the rebel military said that the Ukrainian army opened fire on pro-Russian positions on 26 occasions with automatic grenade launchers, 82 mm mortars, 120 mm mortars and tanks. By evening the separatists had launched 20 attacks on Ukrainian troops. In the area of Donetsk city, the militias fired small arms, automatic grenade launchers and mortars on Krasnohorivka, Opytne, Pisky, Maryinka and Butivka mining complex. Zolote, in the northern front, was struck by mortar fire. Rocket propelled grenades targeted Ukrainian troops at Rozsadky, and small arms fire was reported at Maiorsk, near Horlivka. Around Mariupol the rebels used 122 mm artillery on Ukrainian positions, in spite of a unilateral withdrawal announced by Donetsk People's Republic authorities. Berdyansk and Bohdanivka, in the same area, were hit by 120 mm mortar rounds. Four Ukrainian soldiers were wounded in action near Donetsk and Horlivka on the first day of July. Donetsk People's Republic deputy Minister of Defence, Eduard Basurin, declared that all pro-Russian forces had been withdrawn from Shyrokyne unilaterally, after an agreement with members of the OSCE mission. The separatists broke the truce on 54 occasions in the last 24 hours, 30 of them overnight. Ukrainian authorities claimed that Shyrokyne was attacked again despite the rebel pull out. In the region around Donetsk city, rocket propelled grenades and mortar rounds landed in Pisky and Maryinka. Pervomaisk was hit by 122 mm artillery, and Slavne and Taramchuk were the target of 120 mm mortars. In the northern front, the militias fired small arms, rocket propelled grenades, mortars and antitank missiles on Ukrainian troops at Stanitsya Luhanska, Zolote, Krimsky and Novotoshkivka. Near Mariupol, Berdyansk was pounded with 122 mm guns and 152 mm howitzers. Ukrainian positions at Starohnativka were attacked with mortars and tanks. During the course of the day, pro-Russian forces opened fire on Ukrainian positions on 20 occasions using small arms, antitank missiles, 120 mm mortars, tanks and 122 mm artillery. The Ukrainian army returned fire with machine guns and rocket propelled grenades. The militiants used banned heavy weapons -120 mm mortars and 122 mm artillery- to shell settlements in the area around Mariupol. In the surroundings of Donetsk city, small arms fire raked Ukrainian entrenchments in Opytne and Pisky, while Butivka mining complex was attacked by rebel tanks. Antitank missiles were fired at Leninske, west of Horlivka. According to military spokesman Oleksandr Motuzyanyk, four servicemen were wounded in action in the last 24 hours. The militias' activity decreased sharply overnight. In the northern front, the separatists launched a mortar attack on Stanitsya Luhanska. There were clashes between Ukrainian troops and pro-Russian infantry in Krimsky -where the fighting lasted for one and a half hour-, Shchastya, Trokhizbenka and Zolote. Skirmishes also occurred at Leninske and Kirove, south of Artemivsk. Pisky was the epicenter of the pro-Russian attacks around Donetsk city. Small arms, tanks and heavy mortars pounded Ukrainian positions in the area adjoining Donetsk airport. Separatist authorities reported 35 violations of the truce by the Ukrainian army over the same period. The attacks involved small arms, rocket propelled grenades, 82 mm mortars, 120 mm mortars, antitank missiles and artillery. There were incidents at Horlivka, Shyrokyne, Naverezhne, Kalinivka, Sakhanka, Krasny Partizan, Kuibyshev and Donetsk airport. By evening, pro-Russian forces had carried out 16 attacks on Ukrainian positions along the front, including an infiltration attempt by rebel scouts. From late morning to mid-afternoon, Opytne, west of Donetsk city, was the target of heavy machine guns, 120 mm mortars, 122 mm guns and 152 mm howitzers. The town of Trokhizbenka, in the northern front, was also hit by 152 mm rounds earlier in the morning. Later, heavy mortar rounds landed in Novotroitske, north of Mariupol. In the afternoon 120 mm rounds landed in Rozsadky, Troitske and Sanzharivka, in the area south of Artemivsk. Ukrainian troops drove back pro-Russian scouts near Shchastya at 5:30 pm. One Ukrainian soldier was killed in action and other two wounded in the Donbass during the past 24 hours. According to the Ukrainian military, the separatists broke the truce on 37 occasions overnight. Novotoshkivka, in the northern front, was the target of 120 mm from 21:00 to 23:00 hours. Stanitsya Luhanska was also shelled by pro-Russian forces. After midnight, Novotoshkivka was again the target of heavy weapons, in this case tanks, 120 mm mortars and 122 mm guns. Krimsky was pounded by 120 mm mortars. In the surroundings of Donetsk city, the rebels opened fire on Maryinka, Krasnohorivka and Opytne, where sniper activity was reported. Pisky was attacked by armoured fighting vehicles. South of Artemivsk the militants shelled Rozsadky, Troitske and Maiorsk. The Ukrainian army reported 20 violations of the ceasefire by the militias throughout the day. Antitank missiles were fired on Ukrainian troops near Donetsk airport. A pro-Russian sniper was active in Maryinka, and small arms fire was heard in Avdiivka. South of Artemivsk, the militias attacked Lozove and Novhorodske and in the northern front, Bolotene. The Ukrainian army returned fire. Five Ukrainian soldiers were killed and ten wounded over the past 24 hours. Six of the casualties -three dead and three wounded- were the result of an improvised explosive device that went off near checkpoint nº 29, on Bakhmutka road, Luhansk Oblast. Overnight, the militias launched 30 attacks on Ukrainian troops. The rebels continued to shell Shchastya, in the northern front, with 120 mm mortar rounds. Ukrainian outposts at Krimsky were harassed with small arms fire. South of Artemivsk, the village of Luhanske and Novhorodske were pounded by 120 mm mortars. Around Donetsk city, Pisky was also hit by 120 mm mortar rounds, some of them incendiary. Ukrainian troops at Avdiivka, Starohnativka, Maryinka, Opytne and near Donetsk airport were the target of small arms fire. By evening, pro-Russian troops had opened fire on Ukrainian positions on 30 occasions. In the area of Mariupol, Starohnativka was the target of 120 mm mortars, and heavy 122 mm artillery was fired at Ukrainian troops in Bakhchevyk. Nikolaevka endured a 60-minute shelling from 120 mm mortars. The rebels used small arms against a number of Ukrainian outpost in the northern front, such as Stanitsya Luhanska, Bolotene, Syze, Shchastya and Krimsky. The Ukrainian army also reported hostile fire on Maryinka and Opytne, in the area surrounding Donetsk city. Small arms fire was reported at Lozove and Zolote, south of Artemivsk. Pro-Russian armoured fighting vehicles opened fire on the Ukrainian garrison at Luhanske. Three Ukrainian soldiers were wounded in the last 24 hours. The Ukrainian army claimed that the militias opened fire on Ukrainian positions on 20 occasions last night. There were two instances in which the use of heavy weapons was reported, both in the area around Donetsk city. The first violation was recorded at Pervomaisk, where Ukrainian troops were shelled with tanks and 122 mm artillery. The other took place in Pisky, when Ukrainian positions were attacked with small arms, tanks and 122 mm guns. Maryinka and Opytne were also attacked. In the northern front there were incidents at Stanitsya Luhanska, Shchastya, Syze, Bolotene and Krimsky. South of Artemivsk the militias harassed Ukrainian troops at Troitske, Lozove, Zolote and Luhanske. Near Mariupol Ukrainian outposts at Chermalik, Starohnativka, Bakhchevyk, and Nikolaevka were also fired at by the separatists. After midnight, small arms fire was recorded at Krimsky and Avdiivka. A pro-Russian drone was shot down by Ukrainian air defences over the city of Mariupol. The aircraft fell down to the Sea of Azov. According to military spokesman Andriy Lysenko three Ukrainian servicemen were wounded in action in the last 24 hours. The previous night the militias opened fire on 26 occasions on Ukrainian troops. Near the village of Bohdanivka, north of Mariupol, rebel scouts were engaged by Ukrainian troops and driven back after almost two hours of fighting. Authorities from the People's Republic of Donetsk reported 18 violations of the truce by the Ukrainian army. By evening, pro-Russian troops had broken the ceasefire 29 times, with the use of banned artillery in the areas around Horlivka and Mariupol. Around Mariupol, the village of Hranitne was struck by 152 mm howitzers, while Pavlopil was the target of 120 mm mortar fire. Heavy 120 mm mortar rounds also landed in Novhorodske, west of Horlivka, in Opytne and Vodiane, around Donetsk city, and in Luhanske, south of Artemivsk. Ukrainian troops were harassed with small arms fire in Lozove, Luhanske, Maiorsk, Pisky, Maryinka, Zolote and Stanitsya Luhanska. Separatist authorities reported the shelling of residential areas of Dzerzhinsky, in the region of Mariupol, by the Ukrainian artillery. Two Ukrainian soldiers were killed and ten wounded over the past 24 hours. The Ukrainian positions received hostile fire on 40 occasions overnight. At Luhanske, south of Artemivsk, Ukrainian troops engaged a group of pro-Russian scouts that withdrew after an exchange of fire. Ukrainian outposts at Lozove, Maiorsk, Novhorodske and Svetlodarsk, in the same area, were the target of small arms and 82 mm mortars. In the region west of Donetsk city, banned 120 mm mortar rounds landed in Pisky, while lighter 82 mm mortars pounded Avdiivka and Maryinka. The rebels harassed Ukrainian troops in Opytne, Maryinka and Pisky with small arms fire in the early hours of the morning. Novohryhorivka, north of Mariupol, was shelled with 120 mm mortars. The same weapons were used by the militias to shell Ukrainian positions at Shchastya and Troitske, in the northern front. In the same area, militants fired small arms on Ukrainian soldiers near Stanitsya Luhanska. By evening, pro-Russian forces had opened fire on Ukrainian positions more than 20 times using small arms, rocket propelled grenades, mortars and 152 mm howitzers. The village of Bakhchevyk, in the Mariupol area, was shelled with 152 mm howitzers. at 07:00 am. In the area of Donetsk city, 152 mm rounds also landed in Pisky from 14:00 pm to 16:00 pm. The militias fired small arms, rocket propelled grenades and mortars on Ukrainian troops at Opytne, Maryinka and Avdiivka. Rocket propelled grenades and mortar rounds also pounded Trokhizbenka, Krimsky and Stanitsya Luhanska, in the northern front. One Ukrainian soldier was wounded in the Donbass region over the past 24 hours. The Ukrainian military reported more than 20 attacks on their troops over the previous night. Early in the morning, the rebels fired "Grad" multiple rocket launchers on Ukrainian positions around Hranitne, north of Mariupol. The separatists used small arms, 82 mm and 120 mm mortars and armoured fighting vehicles to shell Krimsky, Stanitsya Luhanska, Pisky, Opytne, Avdiivka, Verkhnotoretske and Vodiane. By evening, pro-Russian forces had violated the truce more than 20 times. According to Hennadiy Moskal one Ukraine soldier was killed and another wounded in a battle near Stanytsia Luhanska at around 05:00 pm. There was intense fire on Ukrainian positions at Novohryhorivka, near Donetsk city. The rebels attacked with 120 mm mortars, tanks and 152 mm howitzers. Heavy 120 mm rounds also landed in Berezove, Olhinka and Novotroitske. The militias used small arms fire to harass Ukrainian troops at Pisky, Avdiivka, Opytne, -around Donetsk city-, Kirove and Luhanske -south of Artemivsk- Krimsky and Stanitsya Luhanska, in the northern front. Sniper fire was reported at Maryinka. Two Ukrainian soldiers were killed in action and other ten wounded during the last 24 hours in the Donbass region. The separatists launched almost 40 attacks on Ukrainian positions across the Donbass last night, firing banned heavy weapons on 17 occasions. Rebel tanks and 120 mm opened fire on Ukrainian troops at Vodiane, Berezove, Avdiivka, Pisky, Opytne -around Donetsk city- and Krimsky, in the northern front. Taramchuk, south of Donetsk city, was the target of 122 mm artillery, and Hranitne, north of Mariupol, was pounded by 152 mm howitzers. Clashes with hostile scouts were reported by the Ukrainian army near Krimsky. According to military spokesman Andriy Lysenko five Ukrainian servicemen were wounded in action in the last 24 hours. The Ukrainian military claim that the militias broke the ceasefire on 50 occasions during the same period, 26 of them firing banned heavy weapons. In the area of Mariupol, Lebedynske and Shyrokyne were hit by 120 mm mortars and 122 mm guns; pro-Russian tanks attacked Novohryhorivka. The militias also shelled Pisky, Troitske, Khimik, Krimsky, Novoselivka, Novhorodske and Verkhnotoretske. In the course of the day, the separatists opened fire on Ukrainian positions more than 20 occasions. Around Donetsk city, Opytne was the target of 120 mm mortars twice in the day. Small arms, rocket propelled grenades and 82 mm mortars were also fired on Opytne and Pisky. In the area south of Artemivsk, heavy 120 mm landed in Troitske. Kirove and Lozove were attacked with small arms, rocket propelled grenades and mortars. In the northern front, the militias harassed Ukrainian troops at Krimsky, Novotoshkivka, Syze and Maiske. Two Ukrainian soldiers were killed in action and other five wounded during the last 24 hours in the Donbass region. The Ukrainian army said the militias attacked their troops on 43 occasions overnight, 18 of them firing banned heavy weapons. The separatists used 120 mm mortars, tanks, 122 mm artillery, 152 mm howitzers and multiple rocket launchers. Heavy shelling was reported on villages around Donetsk city and south of Artemivsk, such as Pisky, Avdiivka, Opytne, Vodiane, Starohnativka and Lozove. Trokhizbenka, in the northern front, was the target of 122 mm guns. Ukrainian forces fended off two infiltration attempts by pro-Russian infantry at Avdiivka and Verkhnotoretske. By evening, several settlements had been shelled by pro-Russian forces, specially Popasna, Avdiivka, Svetlodarsk and Luhanske, all of them pounded by 152 mm howitzers. Heavy 120 mm mortar rounds landed in Opytne and Avdiivka. Also in the area around Donetsk city, antiaircraft Zu-23-2 cannons and small arms were fired on Ukrainian positions near Avdiivka, Pisky and Opytne. The rebels also shelled Stanitsya Luhanska, in the northern front, and Luhanske y Maiorsk, south of Artemivsk. Five Ukrainian soldiers were wounded in the Donbass region over the past 24 hours. The Ukrainian army reported almost 40 attacks on Ukrainian troops overnight, 13 of them with the use of banned heavy weapons. The rebels employed 120 mm mortars, tanks and 122 mm artillery. There were mortar attacks on Ukrainian positions around Kamyanka, in the Mariupol area, Avdiivka, Opytne and Pisky, near Donetsk city, and Novotoshkivka, in the northern front. Verkhnotoretske was the target of heavy artillery fire. Luhanske and Lozove, south of Artemivsk, and Zolote were also the target of small arms and mortars. In Novotoshkivka two Ukrainian soldiers were wounded by an improvised explosive device. By evening, pro-Russian forces had opened fire more than 40 times on Ukrainian positions, 16 of them with heavy weapons banned by the Minsk agreement. The militias fired "Grad" multiple rocket launchers on the village of Nevelske, west of Donetsk city. Early in the morning, Maiorsk and Troitske, south of Artemivsk, and Verkhnotoretske, north of Donetsk city, were hit by 120 mm mortar fire. Heavy 122 mm artillery was fired at Hornik, northwest of Maryinka. Residential areas of Avdiivka were hit by 120 mm mortar rounds. According to military spokesman Andriy Lysenko five Ukrainian servicemen were wounded in action in the last 24 hours. The Ukrainian military recorded 80 attacks on their troops during the same period, five of them using 122 mm and 152 mm artillery. The rebels also fired 120 mm mortars, tanks and multiple rocket launchers. Two hostile drones were shot down by the Ukrainian army. By evening, pro-Russian troops had opened fire on Ukrainian positions on 50 occasions, 19 of them with banned heavy weapons. The separatists employed 152 mm howitzers, 120 mm mortars and tanks. The main targets were the villages of Pisky, Avdiivka and Vodiane, in the area around Donetsk city, and Novhorodske and Luhanske, south of Artemivsk. There were other incidents at Shchastya, Stanitsya Luhanska, Krimsky, in the northern front, and at Maiorsk, south of Artemivsk. Sniper activity was reported at Maryinka. Eight Ukrainian soldiers were killed and 16 wounded over the past 24 hours. Rebel authorities reported two militiamen and a civilian killed, which made this the bloodiest day in over a month. Five servicemen were killed by an improvised explosive device near Stanitsya Luhanska and three by heavy shelling elsewhere. The separatists broke the truce on more than 100 occasions during the same period, 19 of them by firing heavy weapons banned by the Minsk agreement. Ukrainian positions received tank fire, 120 mm mortar rounds, 152 mm and 122 mm artillery fire and multiple fired rockets. Pro-Russian forces opened fire on more than 30 instances across the day, at least four of them using banned heavy weapons. The militias attacked with 120 mm mortars Avdiivka, in the area of Donetsk city, Nikolaevka, north of Mariupol, and Novhorodske, south of Artemivsk. Starohnativka, also in the area of Mariupol, was the target of 122 mm artillery. Ukrainian troops engaged and repelled rebel scouts at Opytne. There was hostile fire on Ukrainian troops at Novotoshkivka, in the northern front, Shyrokyne and Hranitne, near Mariupol, Verkhnotoretske, Maryinka, Krasnohorivka and Pisky, around Donetsk city, and Maiorsk, south of Artemivsk. Separatist authorities said that Horlivka was heavily shelled by Ukrainian forces with tanks and artillery. According to military spokesman Oleksandr Motuzyanyk eleven servicemen were wounded in action in the last 24 hours. A later statement by the Donetsk regional administration press service confirmed one Ukrainian serviceman killed in action and 10 others wounded over the past 24 hours. An undetermined number of civilians were also killed south of Artemivsk when 152 mm howitzers were fired at the village of Kodema. The militias broke the ceasefire 90 times during the same period, 33 of them using banned heavy weapons. The separatists used 120 mm mortars, tanks, 122 mm artillery and 152 mm howitzers. Heavy shelling was reported on Avdiivka, Pervomaisk, Opytne and Verkhnotoretske -Donetsk city area-, Novhorodske, Kirove, Leninske and Maiorsk -south of Artemivsk- and Starohnativka and Nikolaevka, north of Mariupol. In the course of the day, the rebels harassed Ukrainian positions by firing small arms in Shchastya, Shyrokyne and around Donetsk airport. Snipers continued to be active in Maryinka. Novotoshkivka, in the northern front, was shelled by 122 mm artillery. Late in the evening, pro-Russian forces attacked Avdiivka, west of Donetsk city, with 152 mm howitzers and tanks. Residential areas of Opytne were hit by 120 mm mortar rounds. Two Ukrainian soldiers were wounded in the area of Donetsk airfield during the last 24 hours. The militias carried out more than 40 attacks on Ukrainian troops overnight, 23 of them using banned heavy weapons. The most intense shelling took place around Donetsk city, where the rebels targeted Opytne, Pisky and the surroundings of Donetsk airport. Novhorodske, south of Artemivsk, was also pounded with heavy weapons. The rebels used 120 mm mortars, tanks, 122 mm guns and 152 mm howitzers to shell Ukrainian positions at Orikhove and Novotoshkivka, in the northern front, and Opytne. Pisky was hit by 120 mm mortar rounds, some of them incendiary. Ukrainian troops confronted pro-Russian scouts twice. One of the clashes took place near Avdiivka, the other near Staryi Aidar, in the northern front. Separatist authorities reported 36 violation of the ceasefire by Ukrainian troops, which fired 82 mm and 120 mm mortars, tank rounds and heavy artillery on ebel positions. The Ukrainians also used small arms, rocket propelled grenades and antiaircraft cannons. The Ukrainian forces attacked the districts of Kiev, Kuybishev, Spartak, Donetsk airport, Zhabichevo, Yasinuvata and Horlivka. Pro-Russian forces fired 120 mm mortars on Khimik, in the area of Donetsk city, and on Novotroitske, north of Mariupol. There was harassing fire on Ukrainian positions at Pisky, Maryinka and Avdiivka -west of Donetsk city- Shchastya and Stanitsya Luhanska -northern front- and Shyrokyne, east of Mariupol. An observation post manned by members of the Joint Center for the Observation of the Ceasefire was hit by 120 mm mortar rounds. Heavy shelling killed a local civilian resident at Novhorodske, south of Artemivsk. Soldiers from the "Dnipro-2" battalion claimed to have destroyed a mortar firing position near Donetsk city. One Ukrainian soldier was killed in action and other five wounded during the last 24 hours in the Donbass region. One civilian died as result of Ukrainian shelling in Donetsk city, according to separatists sources. Other two civilians were killed in Avdiivka when pro-Russian tanks shelled the town early in the morning. The Ukrainian military reported that the separatists fired on Ukrainian troops on 60 occasions overnight, 38 of them using banned heavy weapons. According to the Ukrainian military "the situation has deteriorated sharply" in eastern Ukraine. In the course of the day, Ukrainian forces near Orikhove confronted a group of rebel scouts, who withdrew after a 30-minute engagement. Rebel forces also opened fire on Opytne, west of Donetsk city, and Hranitne, north of Mariupol, with 152 mm howitzers. Maryinka, in the area of Donetsk city, was shelled by pro-Russian tanks. The militias fired banned 122 mm artillery and 120 mm mortars at Novoselivka, Verkhnotoretske, Avdiivka and Starohnativka. Small arms were used to harass Ukrainian positions at Pisky, Chermalik, Shyrokyne, Krasnohorivka, Stanitsya Luhanska and Shchastya. According to military spokesman Oleksandr Motuzyanyk, one Ukrainian soldier was killed in action and other seven wounded during the last 24 hours in the Donbass region. The Ukrainian army denounced more than 50 violations of the ceasefire by the militias overnight. On more than 30 occasions, the rebels employed banned heavy weapons like 120 mm mortars, tanks, 122 mm artillery and 152 mm howitzers. Civilian casualties were reported at Vodiane when pro-Russian tanks and heavy artillery opened fire on Ukrainian positions in the area. By evening, pro-Russian forces had opened fire on Ukrainian positions more than 20 times in the area of Maryinka only. The militias shelled Yasnobrodivka, Avdiivka, Berezove, Pisky, Pervomaisk -Donetsk city area- Lozove, Kuryumivka, Nikolaevka, Kirove -south of Artemivsk- Novotroitske and Stanitsya Luhanska, in the northern front. Ukrainian troops returned fire with small arms. Five Ukrainian soldiers were wounded near Horlivka and Donetsk during the last 24 hours. The Ukrainian military reported 70 attacks on their troops during the same period, 25 of them overnight and 30 using banned heavy weapons like 120 mm mortars, tanks, 122 mm guns and 152 mm howitzers. The main incidents took place at Maryinka, Nikolaevka, Pisky and Krasnohorivka -Donetsk city area-, Kirove, Maiorsk, Sanzharivka, Rozsadky, Lozove, Luhanske and Zaitseve -south of Artemivsk-, Hranitne, Novotroitske, Lebedynske -Mariupol area- and Stanitsya Luhanska and Shchastya, in the northern front. Across the day, pro-Russian troops opened fire on Ukrainian positions on more than 40 occasions. The militias continued to fire heavy mortars and artillery on Pisky, west of Donetsk city, Novotroitske, in the Mariupol area, Kalinivka, Svetlodarsk, Roszadky, Luhanske and Sanzharivka, south of Artemivsk. The rebels fired small arms on Pisky, Maryinka, Krasnohorivka, Opytne, Berezove -Donetsk area- Kirove, Leninske, Maiorsk -south of Artemivsk- and Stanitsya Luhanska, in the northern front. One Ukrainian serviceman was killed and another person wounded by the explosion of a hand grenade at Yatskivka, Donetsk Oblast. One Ukrainian soldier was killed in action and another wounded during the last 24 hours in the Donbass region. The militias broke the ceasefire more than 60 times during the same period. In 43 occasions they made use of banned heavy weapons. In the area south of Artemivsk, the militias shelled Roszadky, Lozove, Zaitseve and Maiorsk with 152 mm howitzers. Bohdanivka, north of Mariupol, was attacked by rebel tanks. Several Ukrainian checkpoints around Donetsk city were the target of small arms fire. Pro-Russian tanks shelled Avdiivka Coke Plant, and the city itself was hit by 122 mm and 152 mm rounds. By evening, pro-Russian forces had opened fire on Ukrainian positions more than 40 occasions, on 20 of them using banned heavy weapons like 120 mm mortars, tanks, 122 mm guns and 152 mm howitzers, specially in the surroundings of Donetsk airport. At dawn, pro-Russian tanks attacked residential areas of Zaitseve, near Horlivka. Lozove, Kurdyumivka, Krasny Pakhar, Zaitseve, Maiorsk and Rozsadky where shelled with 152 mm howitzers. Rebel tanks shelled Opytne, Bohdanivka and Nikolaevka, while 120 mm mortar rounds landed in Avdiivka and Sanzharivka. Small arms, heavy machine guns and rocket propelled grenades were fired elsewhere. Five Ukrainian soldiers were wounded in action in the last 24 hours. One civilian woman was killed in Opytne, west of Donetsk city. The Ukrainian military reported 80 attacks on Ukrainian troops during the previous day, 40 of them overnight. The rebels shelled Opytne and Vodiane, around Donetsk city, and Novhorodske, south of Artemivsk, with mortars and tanks. Small arms fire, rocket propelled grenades and 82 mm mortars were fired on Avdiivka, Pisky, Donetsk airport, Krasnohorivka, Maryinka, Vodiane - Donetsk city area-, Novhorodske, Maiorsk, Lozove -south of Artemivsk-, Stari Aidar, Zolote -northern front-, and Shyrokyne in the region of Mariupol. By evening, pro-Russian forces had opened fire on Ukrainian positions on 34 occasions. Early in the morning, Ukrainian positions around Donetsk airport received fire from armoured fighting vehicles, while Berezove was hit by 122 mm artillery and 120 mm mortars. At noon, the rebels extended their mortar and artillery attacks on Opytne and Avdiivka. Luhanske, south of Artemivsk, was also the target of heavy weapons. Maryinka, Donetsk airport, Pisky, -around Donetsk city-, Lozove, Luhanske, Svetlodarsk -south of Artemivsk-, and Krimsky, in the northern front, were the target of 82 mm mortars. Sniper activity was reported at Maryinka, Luhanske and Shyrokyne. According to military spokesman Oleksandr Motuzyanyk seven servicemen were wounded in action in the last 24 hours. It was separately reported that one Ukrainian soldier was lethally wounded near Avdiivka, and another wounded soldier died later in a hospital. The separatists broke the ceasefire more than 50 times overnight. Novhorodske, south of Artemivsk, was hit by heavy 122 mm artillery from rebel-held Horlivka. Ukrainian troops at Leninske were targeted by 120 mm mortar fire. Around Donetsk city, Avdiivka, Opytne and Pisky were shelled with 122 mm guns and 120 mm mortars. An infiltration attempt by pro-Russian scouts near Opytne was driven back by Ukrainian forces. During the day, pro-Russian forces fired upon Ukrainian positions on more than 40 occasions, including an ambush attempt on Ukrainian troops near Syze, in the northern front. Heavy 120 mm mortar fire was reported at Avdiivka, Pervomaisk, Opytne, Lozove and Roszadky, while Ukrainian outposts at Maryinka and Opytne were racked by small arms and 82 mm mortars. The militias also attacked Pisky, Krasnohorivka, Donetsk airport surroundings, Trokhizbenka and Stanytsia Luhanska. According to military spokesman Andriy Lysenko one Ukrainian soldier was killed in action and other three wounded during the last 24 hours in the Donbass region. There were more than 70 instances of violation of the truce by separatist forces during the same period, 35 of them overnight. Most incidents took place around Donetsk city and south of Artemivsk. Rebel tanks shelled Novhorodske and Pisky. In the first case, the fire came from the direction of rebel-held Horlivka. Pisky and Krasnohorivka were later hit by 120 mm mortar rounds. Heavy artillery rounds -from 122 mm guns and 152 mm howitzers- landed in Opytne, Avdiivka and Berezove. Light weapons fire took place in Novhorodske, Roszadky, Avdiivka, Kirove, Stanitsya Luhanska, Sanzharivka, Luhanske, Kriakivka, Popasna, Maryinka and Pisky. Ukrainian troops at Stepne, near Volnovakha, shot down a hostile drone. Across the day, pro-Russian troops opened fire on more than 40 occasions on Ukrainian positions. The use of banned heavy weapons dropped sharply, although the town of Novhorodske was hit by 122 mm artillery from Horlivka in the afternoon. The militias harassed Ukrainian troops at Maryinka, Pisky, Opytne, Donetsk airport, Luhanske, Popasna, Lozove and Chermalik with small arms and mortar fire. The Ukrainian military claimed that Novhorodske was hit by incendiary rounds. One Ukrainian soldier was wounded in action in the last 24 hours. Three enlistees were killed and four injured in a fatal accident that occurred near Pervomaiske in Donetsk oblast. The Ukrainian army recorded more than 70 attacks on Ukrainian troops in the same period. The rebels used 120 mm mortars, tanks, 122 mm and 152 mm artillery. Most incidents took place at Starohnativka, Bohdanivka -Mariupol area-, Pisky, Avdiivka, Verkhnotoretske, Donetsk airport -west of Donetsk city-, Lozove, Novhorodske, Leninske and Luhanske, south of Artemivsk. Heavy shelling was reported near Volnovakha on positions manned by members of the Ukrainian 72nd mechanized brigade. The militias fired 122 mm artillery rounds, using drones to direct the fire. The guns were later joined by 120 mm mortars, tanks and 152 mm howitzers. The bombardment lasted for two hours. By evening pro-Russian forces had broken the ceasefire on 35 occasions. According to military spokesman Oleksandr Motuzyanyk three servicemen were wounded in action in the last 24 hours. A member of the Ukrainian National Guard committed suicide while manning a checkpoint in the Donbass region. The Ukrainian army recorded 39 ceasefire violations by the militias overnight. At noon, pro-Russian forces attacked Ukrainian troops near Shchastya with small arms, rocket propelled grenades and tanks. There were also infiltration attempts by infantry units. The Ukrainian military fired back. Fighting in the area was over by 02:20 pm. Ukrainian authorities claimed that their troops received fire from the militias on 35 occasions during the day. One Ukrainian soldier was killed in action and other seven wounded during the last 24 hours in the Donbass region. One civilian was wounded in Avdiivka. The Ukrainian military reported 86 attacks on their troops over the same period. The militias used banned heavy weapons like 120 mm mortars, tanks, 122 mm guns, 152 mm howitzers and "Grad" multiple rocket launchers. The Ukrainian garrison at Nikolaevka, south of Artemivsk, was the target of small arms, 120 mm mortars, tanks and 152 mm artillery from the rebel-held settlements of Horlivka, Zaitseve and Holmivskiy. Maiorsk and Pervomaisk were also shelled with 152 mm howitzers and 120 mm mortars from Horlivka. There was harassing fire on Ukrainian forces at Maryinka, Shyrokyne, Opytne, Avdiivka, Pisky, Maiorsk, Kirove, Pervomaisk, Stanitsya Luhanska and Shchastya. Separatist media reported 46 violations of the truce by Ukrainian forces using small arms, automatic grenade launchers, rocket propelled grenades, light and heavy mortars, tanks, 12 mm guns and 152 mm howitzers. From 0:00 am to 06:00 am the Ukrainian army recorded the highest number of attacks since the signing of the Minsk agreement. The apparent reason according to Ukrainian officials is that the rebels seek to use the dark hours to hide their firing positions to OSCE and Joint Center for the Observation of the Ceasefire (STSKK) monitors. Svetlodarsk, south of Artemivsk, was the target of 152 mm howitzers. Shchastya, in the northern front, was shelled by pro-Russian tanks deployed at Vesela Hora. Opytne was attacked for three hours with 120 mm mortars, tanks, 122 mm artillery and "Grad" artillery rockets firing from Donetsk city and Spartak. "Grad" rockets launched from the same locations landed in nearby Vodiane. Heavy 120 mm mortars, 122 mm guns and 152 mm howitzers were also fired on Ukrainian positions at Maiorsk, Nikolaevka -south of Artemivsk-, Hranitne, Starohnativka -Mariupol area-, Vodiane, Pisky, Prvomaisk, Opytne -around Donetsk city-, Shchastya and Stanitsya Luhanska, in the northern front. Pro-Russian tanks shelled Opytne and Krasnohorivka. Ukrainian forces beat off an infiltration attempt near Kryakivka, Luhansk Oblast, northern front. From dawn to evening, pro-Russian troops opened fire on Ukrainian troops at Kirove, Maiorsk, -south of Artemivsk-, Opytne -west of Donetsk city-, Shchastya and Stanitsya Luhanska, in the northern front, with small arms and mortars. According to military spokesman Andriy Lysenko one Ukrainian soldier was killed in action and other 12 wounded during the last 24 hours in the Donbass region. A member of the OSCE Special Monitoring Mission (SMM) to Ukraine's team was injured by debris in Shyrokyne. The militias fired on Ukrainian troops on more than 80 occasions during the past day, more than 30 of them overnight. The rebels used 120 mm mortars, tanks, 122 mm guns, 152 mm howitzers and "Grad" multiple rocket launchers. Stanitsya Luhanska endured a three-hour attack with small arms, mortars and 122 mm artillery. By evening, pro-Russian forces had opened fire on Ukrainian positions on 47 occasions, specially around Shchastya, in the northern front. The town was shelled by the separatists with 82 mm mortars and tanks deployed on Milova Hora. The militias also attacked south of Artemivsk, where the village of Kudyumivka was the target of 152 mm howitzers. Travneve, in the same area, was fired at by tanks. Around Donetsk city, 120 mm mortars landed in Avdiivka, and Maryinka, while 122 mm artillery rounds struck Opytne. A sniper was active near Maryinka. Harassing fire was reported at Krasnohorivka, Pisky, Opytne, Nikolaevka, Avdiivka and in Stanitsya Luhanska, in the northern front. Heavy shelling on Shchastya's power station left most of Luhansk Oblast without electricity. According to military spokesman Oleksandr Motuzyanyk two servicemen were wounded in action near Maryinka in the last 24 hours. There were more than 80 attacks on Ukrainian troops along the front during the same period, including two attempted assaults on Ukrainian positions at Avdiivka and Shchastya. Separatist authorities said that the Ukrainian army broke the truce on 21 occasions by firing small arms, rocket propelled grenades, mortars, tank's main guns and artillery. The Ukrainian forces pounded rebel positions at Zaitseve, Petrovsky district, Abamukova mining complex, Donetsk airport, Yasinuvata and Horlivka. One civilian was reported killed and another wounded in rebel-held Horlivka. By evening pro-Russian forces had fired banned heavy weapons on Ukrainian positions on 13 occasions. Stepne, south of Donetsk city, Troitske, south of Artemivsk, Novozvanivka and Popasna, both in the northern front, were the target of 120 mm mortar rounds. Nikolaevka, in the region of Artemivsk, was the target of 152 mm howitzers. At noon, pro-Russian tanks attacked Hranitne, north of Mariupol. Ukrainian troops at Pisky, Maryinka and Avdiivka were harassed with small arms fire and rocket propelled grenades. According to military spokesman Andriy Lysenko four Ukrainian soldiers were wounded in action in the last 24 hours. Two civilians were killed and one was wounded in the city of Dzerzhynsk, west of Horlivka, in the Donetsk region. According to the state prosecutor one Ukrainian serviceman was also killed. The casualty reports could not be independently verified. The militias opened fire on Ukrainian troops on 82 occasions during the previous day using small arms, rocket propelled grenades, mortars, tanks, 122 mm guns and 152 mm howitzers, particularly around Donetsk city and in the area south of Artemivsk. In the course of the day, pro-Russian forces launched 67 attacks on Ukrainian positions with small arms, rocket propelled grenades, 120 mm mortars, tanks and 122 mm artillery. In the area of Mariupol, the militias shelled Starohnativka from two different positions – Novolaspa and Starolaspa – with 120 mm mortars and 122 mm guns. South of Artemivsk, the village of Nikolaevka was the target of 120 mm mortars and tank rounds. Pro-Russian tanks also shelled Maiorsk. Ukrainian redoubts near Vodiane, northwest of Donetsk city, were hit by 120 mm mortar rounds. Two Ukrainian soldiers were killed and seven wounded over the past 24 hours. The Ukrainian military claimed that the militias broke the ceasefire on 46 occasions overnight. The separatists used small arms, rocket propelled grenades, mortars, armoured fighting vehicles, tanks and artillery. According to military analyst Dmitry Timchuk, two members of the Dnipro Battalion died during the last day of July. One was killed by mortar fire, another died in a hospital of wounds caused by a sniper. By evening, pro-Russian forces had opened fire on Ukrainian positions on 40 occasions, including an infiltration attempt by rebel infantry near Zolote, repelled by the Ukrainian army. According to military spokesman Andriy Lysenko two Ukrainian soldiers were killed in action and another 14 were wounded in the Donbass region during the last 24 hours. Most of the casualties occurred around Donetsk city. Two servicemen were wounded near Zolote, Luhansk Oblast. The Ukrainian army claimed that the militias broke the ceasefire on 109 occasions, 70 of them in the surroundings of Donetsk city. The militias shelled Avdiivka and Pisky with 120 mm mortars. Opytne was the target of armoured fighting vehicles, tanks and 120 mm mortars. Civilian residences at Verkhnotoretske and Avdiivka were pounded by rebel fire during the night. Pro-Russian tanks fired at Ukrainian positions at Nikolaevka, south of Artemivsk. There were more than 40 separatist attacks on Ukrainian troops across the day. Most incidents took place around Donetsk city. Pro-Russian forces continued to pound Opytne at early morning with small arms, 120 mm mortars, tanks and 122 mm artillery. Pervomaisk was the target of 152 mm howitzers and Vodiane was hit by 122 mm guns. At noon, Ukrainian positions around Pisky and Opytne were harassed with small arms and rocket propelled grenades. Residential areas of Maryinka were struck by mortar fire, while nearby Maksymilyanivka was attacked by rebel tanks. Eight Ukrainian soldiers were wounded in action in the last 24 hours. The Ukrainian military recorded 83 attacks during the same period, 51 of them around Donetsk city. The rebels shelled Ukrainian redoubts at Avdiivka, Krasnohorivka and Opytne with 120 mm mortars. South of Artemivsk, 120 mm rounds landed in Zolote, and armoured fighting vehicles fired upon Ukrainian positions in Troitske. Across the day, the militias broke the ceasefire another 51 occasions, specially in the areas west of Donetsk city and south of Artemivsk. The militias shelled Opytne, Pisky and Avdiivka with 120 mm mortars and tanks. Avdiivka was also hit by 152 mm artillery rounds. South of Artemivsk the rebels shelled Luhanske, Roszadky, Sanzharivka and Zolote with 120 mm mortars. The OSCE Special Monitoring Mission (SMM) revisited five "DPR" and four Ukrainian Armed Forces heavy weapons holding areas. An armed man guarding the facility at one of the "DPR" sites claimed that he and those present at the site were part of the 16th airborne brigade from Orenburg, Russian Federation. They did not wear identifying insignia. Russian Ministry of Defence declared later that a brigade with such number and/or name does not exist. Russian presidential spokesman Dmitry Peskov said on August 4 that "the trustworthiness of these reports needs to be verified". Positions of Ukrainian Armed Forces near Stanytsia Luhanska were shelled by 152 mm artillery during the last hours of the day, as a result two Ukrainian soldiers were killed. According to military spokesman Andriy Lysenko four Ukrainian soldiers were killed in action and other 15 wounded in the Donbass region during the last 24 hours. The militias broke the truce on 99 instances in the same period, Again, the rebels concentrated their attacks in the area around Donetsk city. Avdiivka, Opytne and Pisky were hit by 120 mm mortar twice. At dusk, Pisky was shelled again by rebel tanks. The area of Mariupol experimented an increase in the number of incidents. Novohryhorivka, Bohdanivka and Starohnativka were hit by 120 mm mortar fire. Residential areas of Hranitne were the target of 122 mm artillery rounds. In the northern front 122 mm guns were used to shell Valuiske, east of Stanitsya Luhanska. Gas pipelines and power lines were damaged, and a high-rank official in the Ukrainian Directorate for Road Traffic Safety was seriously wounded. By evening, pro-Russian forces had opened fire on 46 occasions on Ukrainian positions using small arms, rocket propelled grenades, mortars, tanks and artillery. The separatists continued to focus their attention on the areas around Donetsk city and Mariupol. Avdiivka was shelled three times with 120 mm mortars. Residential areas of the town were later hit by 152 mm howitzers firing for rebel-held Spartak. Heavy 120 mm mortar rounds also landed in Troitske, southwest of Horlivka. Pro-Russian tanks attacked Pervomaisk and Opytne. In the area of Mariupol, Ukrainian troops at Starohnativka were pounded by 120 mm mortars and 122 mm artillery. Krimsky, in the northern front, was also the target of 120 mm mortar fire. Three Ukrainian soldiers were killed in action and other seven wounded during the last 24 hours in the Donbass region. A tractor hit a landmine near Talakivka, the driver was hospitalized. Two of the fatalities were the result of heavy shelling on Stanitsya Luhaska. The Ukrainian military recorded 109 attacks during the previous day. In the course of the day, the militias used banned heavy weapons on 20 occasions, including an infiltration attempt by rebel scouts near Leninske, south of Artemivsk. The militias employed 120 mm mortars, tanks and 122 mm guns and 152 mm howitzers. Seven Ukrainian soldiers were wounded in action in the Donbass region during the last 24 hours. The Ukrainian military reported 81 attacks on their troops over the same period, including two assault attempts on Ukrainian positions at Verkhnetoretske, north of Donetsk city. Across the day, the separatist continued their pressure on Ukrainian forces around Donetsk city. Most combat incidents took place during the hours of dusk. Avdiivka, Opytne and Vodiane were shelled with 120 mm mortar fire. Avdiivka was also hit by 122 mm artillery rounds. One Ukrainian soldier was wounded by mortar fire early in the morning at Troitske, in the northern front. Nearby Krimsky was also targeted by rebel mortars. A farm was hit by a number of mortar rounds that killed seven heads of cattle and ignited a fire. Several areas in the northern part of Luhansk Oblast were left without power after heavy shelling damaged Shchastya's power station. According to military spokesman Oleksandr Motuzyanyk five Ukrainian soldiers were killed in action and other six wounded in the Donbass region during the last 24 hours. During the same period the rebels opened fire on Ukrainian troops on 65 occasions using small arms, rocket propelled grenades, 120 mm mortars, tanks and 122 mm artillery. By evening, pro-Russian forces had broken the truce on more than 40 occasions. Around Donetsk city, rebel tanks shelled Pisky and Vodiane, while 120 mm mortar rounds fell on Opytne. Residential areas of Avdiivka were also hit by mortars, and a civilian was wounded as a result. South of Artemivsk, Leninske and Maiorsk were also the target of 120 mm mortar fire. In the northern front, after a period of calm, pro-Russian tanks attacked Shchastya in the afternoon. Sniper fire was also reported in the same area. Two Ukrainian soldiers were killed in action and other seven wounded during the last 24 hours in the Donbass region. A civilian was confirmed wounded in Avdiivka. The Ukrainian army reported that the militias broke the ceasefire on 106 occasions on the same period, including a two-hour engagement between Ukrainian troops and 20 rebel fighters supported by 120 mm mortars in Krasnohorivka. Seventy-eight incidents took place in the area of Donetsk city. For the first time in weeks, separatist forces fired multiple rocket launchers on Ukrainian positions near Troitske, in the Artemivsk area. During the morning pro-Russian tanks continued to shell Shchastya, in the northern front, and Pisky, west of Donetsk city. Vodiane and Opytne were hit by 120 mm mortar fire, and 122 mm artillery rounds landed in Pervomaisk, Opytne and Avdiivka. Ukrainian outposts around Zaitseve, south of Artemivsk, were attacked with 120 mm mortars, armoured fighting vehicles and tanks. According to military spokesman Andriy Lysenko one Ukrainian soldier was killed in action and other nine were wounded during the last 24 hours in the Donbass region. The militias pounded Ukrainian positions 101 times over the same period with small arms, rocket propelled grenades, mortars, tanks and artillery. By evening pro-Russian forces had broken the ceasefire on more than 60 occasions, particularly around Donetsk city and south of Artemivsk. In the northern front, rebel tanks shelled Shchastya at dawn. In the surroundings of Donetsk city, 120 mm mortar rounds landed in Opytne and Vodiane. Avdiivka, Pervomaisk and Opytne were also the target of 122 mm artillery. Pro-Russian tanks attacked Ukrainian positions at Pisky. The separatists attacked Ukrainian outposts at Zaitseve, south of Artemivsk, using mortars, armoured fighting vehicles and tanks. According to military spokesman Oleksandr Motuzyanyk one Ukrainian soldier was killed in action and other ten were wounded in the Donbass region during the last 24 hours. Four armored vehicles belonging to the Special Monitoring Mission (SMM) of the OSCE were torched during the night in the city of Donetsk. In an escalation of military activity, Ukrainian positions were attacked on 111 occasions on the past day. The rebels used banned heavy weapons like 120 mm mortars, tanks, artillery and "Grad" multiple rocket launchers. In the course of the day, the Ukrainian military recorded more than 70 attacks on their troops, specially around Donetsk city, south of Artemivsk and in the area of Mariupol. One Ukrainian soldier was killed in action and other 16 were wounded in the Donbass region during the last 24 hours. The militias opened fire on Ukrainian troops on 127 occasions over the same period. Early in the morning, a major battle took place in the area of Starohnativka, north of Mariupol. Ukrainian officials from the 72 mechanized brigade and Right Sector volunteers claimed that their positions were assaulted by a pro-Russian armoured unit composed of ten tanks, ten armoured fighting vehicles and 400 troops supported by 122 mm artillery fire. According to them, the offensive was halted, and in the subsequent counterattack Ukrainian forces evicted the militias from the heights around Starohnativka. Right Sector's sources said the focal point of the fighting was the village of Bila Kamyanka, and that seven Ukrainian servicemen were killed and 11 wounded. Ukrainian journalist Andriy Stapilenko reported one death and nine wounded among members of the 72 mechanized brigade. He also reported one tank lost. Separatist sources alleged that the battle was the result of a Ukrainian attempt to seize the nearby village of Novolaspa, and that their troops forced the intruders to withdraw. One rebel soldier was wounded. At mid-morning, the Ukrainian garrison at Starohnativka was the target of "Grad" multiple rocket volleys. Donetsk People's Republic deputy ministry of defence, Eduard Basurin, said the Ukrainian army also fired "Grad" rockets on Telmanovo, where a civilian woman was killed by artillery fire later in the evening. In other parts of the front, the Ukrainian military recorded 37 violations of the truce by pro-Russian forces. Around Donetsk city, Vodiane was shelled by 120 mm mortars and 122 mm artillery. Rebel tanks attacked Maryinka and Opytne. Ukrainian positions south of Artemivsk were pounded by 152 mm artillery fire. According to military spokesman Oleksandr Motuzyanyk one Ukrainian soldier was killed in action and other 13 were wounded in the Donbass region during the last 24 hours. According to Information Resistance at least 19 wounded Ukrainian soldiers were hospitalized in Volnovakha by the evening of August 10. The Ukrainian military recorded almost 100 attacks on their troops the previous night, particularly in the surroundings of Donetsk city. Pro-Russian forces continued their activity around Starohnativka during the day, firing 152 mm howitzers on Ukrainian positions on two occasions in the course of the morning. Ukrainian troops repelled two infiltration attempts supported by small arms fire. The nearby village of Bohdanivka was the target of multiple rocket barrages. According to the Ministry of Defence 7,329 Ukrainian servicemen had received awards during the war, 1,415 of them posthumously. During the same period of time 167 members of the National Guard had been killed in action. One Ukrainian soldier was killed in action and other three were wounded in the Donbass region during the last 24 hours. All the casualties occurred near Stanytsia Luhanska and Starohnativka. There were 87 violations of the truce by the militias on the previous day. Novhorodske, near Horlivka, Pisky and Avdiivka were the target of 120 mm mortar rounds. Right before midnight, Krasnohorivka was hit by 152 mm artillery rounds and "Grad" artillery rockets. In the area of Mariupol, heavy 122 mm and 152 mm artillery was fired at the villages of Chermalik and Starohnativka. In the northern front, the Ukrainian garrison at Krimsky was the target of small arms, rocket propelled grenades and mortar fire. Zaitseve, south of Artemivsk, was pounded by 120 mm mortar rounds. Rebel artillery damaged an oil pipeline in Avdiivka, setting a number of nearby houses on fire. No victims were reported. By evening, pro-Russian forces continued the use of banned heavy weapons through the day. Early in the morning "Grad" multiple rocket volleys fell on Ukrainian positions around Donetsk city, like Novoselivka, Opytne, Pisky and Vodiane. Mortar fire was reported at Krasnohorivka and Maryinka. In the area of Mariupol, the separatists renewed the heavy shelling on Ukrainian outposts around Starohnativka, this time with 120 mm mortars, 122 mm artillery and 152 mm howitzers. "Grad" rockets also landed in Bohdanivka. South of Artemivsk a group of eight intruders attacked a Ukrainian observation post with small arms fire. Two Ukrainian servicemen were reported killed in action and ten others wounded in the Donbass region during the last 24 hours. In what became the worst spell of violence in weeks, rebel troops opened fire on Ukrainian positions on 152 occasions during the same period. Early in the morning pro-Russian infantry attempted to break through the Ukrainian lines near the village of Semyhirya, south of Artemivsk. Later, the area was subjected to heavy shelling with 152 mm howitzers. Around Donetsk city, Novhorodske was struck by 122 mm artillery rounds, while rocket propelled grenades and 120 mm rounds fell on Avdiivka. In the area of Mariupol, Orlivske was the target of 122 mm artillery and Shyrokyne was hit by 120 mm rounds. Starohnativka was again fired at by the militias with 152 mm howitzers. In the northern front, 152 mm and mortar rounds also landed around Ukrainian positions in Bolotene. One Ukrainian serviceman was killed in action and six others were wounded in the Donbass region during the last 24 hours. One civilian was reported killed in Horlivka according to rebel officials. The militias opened fire on Ukrainian positions on 95 occasions during the same period, according to the Ukrainian military. Across the day, pro-Russian forces continued to harass Ukrainian positions, specially those around Donetsk city. In the early hours of the morning, the militias launched multiple rocket barrages on Vodiane, Opytne and Krasnohorivka. Troitske, Novobakhmutivka, Avdiivka and Pervomaisk were meanwhile the target of 152 mm howitzers. The separatists also used howitzers to shell Starohnativka and Novohryhorivka, in the region of Mariupol. Residential areas of Bakhchevyk were hit by "Grad" artillery rockets. Multiple rocket volleys also landed around Ukrainian positions at Zaitseve, south of Artemivsk. Nearby Leninske was struck by 120 mm mortar fire. There was a botched infiltration attempt by separatist troops near Syze, in the northern front. Two Ukrainian servicemen were wounded in action in the Donbass region during the last 24 hours. Three civilians were reported killed and at least 18 injured in eastern Ukraine during the same period. The Ukrainian military said that 14 August marked the most intense activity in months, with 175 rebel attacks on Ukrainian troops. In the area around Donetsk city, the militias pounded Ukrainian positions at Avdiivka, Novoselivka, Novobakhmutivka, Novomyhailivka, Pervomaisk and Vodiane with 152 mm howitzers. Mortar rounds landed in Abakumova mining complex, Nevelske, Pisky, Opytne and Vodiane. Krasnohorivka was the target of 120 mm mortars on four occasions. Talakivka, east of Mariupol, was hit by multiple rocket barrages and 120 mm mortar rounds. Residential areas of Pavlopil were rocket by artillery fire. South of Artemivsk, Dzerzhinsky, Sanzharivka and Leninske were also the target of rebel artillery. Pro-Russian tanks attacked Zaitseve, supported by 120 mm mortars. Early in the morning, "Grad" artillery rockets landed in Pervomaisk, west of Donetsk city. An hour later, Karlivka was struck by 152 mm artillery rounds. In the area south of Artemivsk, Ukrainian positions near Luhanske were attacked with rocket propelled grenades and armoured fighting vehicles. Zaitseve was again the target of mortar fire. Around Mariupol, mortar rounds landed in Starohnativka, Talakivka and Hranitne. Stahronativka anmd Talakivka were later pounded by heavy artillery rounds. In the northern front, the militias fired rocket propelled grenades and antitank missiles on Ukrainian troops at Trokhizbenka. Six Ukrainian servicemen were reported wounded in action in the Donbass region during the last 24 hours. The militias opened fire on 136 occasions on Ukrainian troops over the same period. The rebels used small arms, rocket propelled grenades, mortars, artillery and "Grad" multiple rocket launchers. In the course of the day pro-Russian forces concentrated their efforts in the area of Donetsk city. Heavy artillery rounds fell on Ukrainian positions near Avdiivka and Taramchuk early in the morning. Some hours later, armoured vehicles and machine guns opened fire on Ukrainian troops at Opytne. Pisky, Krasnohorivka and Verkhnotoretske were the target of 120 mm mortar fire. At noon, the village of Novokalinovo was hit by 122 mm artillery volleys. A checkpoint in Aleksandrivka manned by Ukrainian border guards was attacked four times with small arms, automatic grenade launchers and mortars. Ukrainian troops at Stanitsya Luhanska, in the northern front, were harassed with rocket propelled grenades and 120 mm mortars. Zaitseve, south of Artemivsk, was pounded twice by 122 mm artillery fire. The militias fired 120 mm mortars at Bohdanivka and Starohnativka, north of Mariupol. Late in the night, "Grad" artillery rocket landed in Sartana and Lebedynske. A number of civilian casualties were reported. According to military spokesman Andriy Lysenko two Ukrainian soldiers were killed in action and seven others wounded in the Donbass region during the last 24 hours. At least two civilians were killed and six injured in Sartana. According to the rebels at least three civilians were killed and four wounded in Horlivka. The Ukrainian military recorded 148 violations of the truce by the militias on the previous day. The number of hostile incidents had decreased sharply through the day. In the area around Donetsk city, pro-Russian tanks shelled Novomyhailivka in the very first hours of the morning. Shortly after, 122 mm artillery rounds landed in Pervomaisk and Krasnohorivka. By noon, Verkhnotoretske and Krasnohorivka were hit by 120 mm mortar fire. North of Mariupol, Starohnativka was the target of 122 mm guns. One Ukrainian soldier was killed and another wounded in action in the Donbass region during the last 24 hours. The militias launched 86 attacks on Ukrainian troops during the same period. There was a lull in the fighting across the front during the day. Harassing fire, however, was witnessed by Ukrainian troops around Donetsk city, where pro-Russian forces used small arms and rocket propelled grenades. In the afternoon, Maryinka was instead the target of 120 mm mortar fire and antitank missiles. In the northern front, Ukrainian positions around Stanitsya Luhanska were pounded by rocket propelled grenades, mortar rounds and antiaircraft cannons. In the area of Mariupol, the rebels shelled Shyrokyne with rocket propelled grenades and 120 mm mortars. Bohdanivka was hit by 122 mm artillery rounds. Three Ukrainian soldiers were wounded in action during the last 24 hours. One civilian was wounded in Stanytsia Luhanska. The Ukrainian military said that the militias launched 82 attacks on Ukrainian troops during the same period. Most incidents took place around Donetsk city, where the main target was the village of Opytne, pounded with small arms, rocket propelled grenades, 120 mm mortars and armoured fighting vehicles. Mortar rounds landed in Pisky and 122 mm guns were fired at Krasnohorivka. Residential areas of Avdiivka were hit by "Grad" multiple rocket volleys. In the northern front, Ukrainian positions near Stanitsya Luhanska were harassed with small arms fire, rocket propelled grenades and mortar fire. In the region of Mariupol, Shyrokyne and Novotroitske were shelled by the rebels, the latter with 122 mm artillery. South of Artemivsk, the separatists fired mortars and antitank missiles on Ukrainian troops at Luhanske. In the course of the day, two Ukrainian soldiers were killed and another wounded by an improvised explosive device in Orikhove, Luhansk Oblast. Around Donetsk city, "Grad" artillery rockets landed in Novobakhmutivka in the first hours of the morning. At dawn, pro-Russian tanks attacked residential neighborhoods of Maryinka. In the area of Mariupol, Starohnativka and Novotroitske were the target of 122 mm artillery. The Ukrainian garrison at Pavlopil was shelled by the rebels using mortars. The village of Travneve, south of Artemivsk, was hit by 120 mm mortar rounds. According to military spokesman Oleksandr Motuzyanyk four Ukrainian soldiers were killed in action and 14 wounded in the Donbass region during the last 24 hours. Four Ukrainian soldiers had been released by the rebels. The militias broke the ceasefire on 67 occasions over the same period, according to Ukrainian authorities. Pro-Russian forces used mostly small arms, rocket propelled grenades and mortars. There were three attacks with artillery and one with multiple rocket launchers. During the day, the intensity of the rebel attacks died down. There were, however, a number of incidents involving banned heavy weapons. In Mariupol's region, the militias fired 122 mm guns on Ukrainian positions near the village of Lebedynske. The Ukrainian garrison at Lipove, south of Artemivsk, was the target of "Grad" multiple rocket barrages launched from nearby Pervomaisk. Around Donetsk city, where most of the truce violations took place, the militias shelled Kamyanka and Novoselivka with 152 mm howitzers. The separatists executed harassing fire with small arms and rocket propelled grenades on Ukrainian troops in Avdiivka, Pisky, Krasnohorivka, Maryinka and Opytne. According to military spokesman Andriy Lysenko two Ukrainian soldiers were wounded in action in the Donbass region during the last 24 hours. The militias broke the ceasefire on 67 occasions over the same period. By evening, pro-Russian forces had broken the ceasefire 58 times, including a botched infiltration attempt repelled by the Ukrainian army near Artemivsk. Around Donetsk city, the militias opened fire on Ukrainian positions at Avdiivka, Krasnohorivka, Pisky and Opytne with small arms, rocket propelled grenades and mortars. Maryinka was the subject of a three-hour attack with automatic weapons, rocket propelled grenades, mortars and tanks. The militias were particularly active in Mariupol's region, where the villages of Prokhorivka, Lebendiske, Starohnativka and Bohdanivka were rocked at early morning by the explosions of heavy artillery shells. Starohnativka was hit again at dawn by 155 mm howitzer rounds, and some hours later by 122 mm artillery fire. Vynohrade, in the eastern surroundings of Mariupol, was also the target of 122 mm artillery barrages. According to military spokesman Oleksandr Motuzyanyk eight Ukrainian soldiers were wounded in action in the Donbass region during the last 24 hours. The Ukrainian military said the situation at the front was worsening, with heavy shelling near Mariupol and in areas of Luhansk Oblast. In the northern front -Luhansk Oblast- Ukrainian positions around the village of Zolote were the target of 82 mm mortars, armoured fighting vehicles, 122 mm artillery and "Grad-p" single rocket launchers. The town of Popasna was hit by 120 mm mortar rounds and 122 mm artillery salvos. Along Bakhmutka road, in the same area, the rebels pounded the villages of Novotoshkivka and Svitlychne with 120 mm mortar fire. Heavy 152 mm artillery volleys landed in Valuiske. Around Donetsk city, Krasnohorivka, Pisky and Maryinka were shelled with 120 mm mortars. In Mariupol's region, the rebels' artillery shelled the Ukrainian strongholds of Stahronativka, Bohdanivka, Prokhorivka, Starohnativka, Lebedynske and Vynohradne. Ukrainian troops at Novoselivka received small arms fire. The Ukrainian army recorded a total of 102 rebel attacks on their troops over the past day. Across the day, rebel forces continued to focus their efforts west of Donetsk city, where they shelled Kamyanka with 120 mm mortar fire and Avdiivka with 122 mm artillery in the first hours of the morning. Some hours later, pro-Russian armoured fighting vehicles attacked the stronghold of Opytne, supported by small arms fire. Mortar rounds landed in Krasnohorivka at noon. In the northern front, heavy artillery from rebel-held Pryvitne poured 152 mm rounds on Ukrainian troops at nearby Shchastya. An infiltration attempt near Krimsky was beaten off by Ukrainian troops. South of Artemivsk, the Ukrainian garrison at Luhanske was harassed with small arms, heavy machine guns and rocket propelled grenades. Shyrokyne, east of Mariupol, was struck by 120 mm mortar fire. President Poroshenko, speaking at military rally in Kharkiv region, expressed an opinion that military pressure on Ukraine from Russia and the separatists that Moscow supports is likely to last decades. The death toll stood at 6,500 civilians, Ukrainian soldiers and militiamen. One Ukrainian soldier was killed and four others were wounded in action in the Donbass region during the last 24 hours. The Ukrainian military recorded 78 violations of the truce by the militias on the previous day. Last night, the militias broke the Minsk agreements on heavy weapons on several instances. In the surroundings of Donetsk city, the militantes shelled the Ukrainian strongholds of Krasnohorivka, Avdiivka and Butivka mining complex with 120 mm mortars. Popasna, east of Artemivsk, was the target of the same kind of weapon. In the northern front, small arms, heavy machine guns and mortars were fired at three Ukrainian outposts in Stanitsya Luhanska. Krimsky was attacked by pro-Russian tanks before midnight. The Ukrainian army reported small arms fire in Hranitne, north of Mariupol. In the course of the day the separatist continued to poured mortar and artillery rounds on Ukrainian positions. In Stanitsya Luhanska, after enduring heavy machine gun fire and rocket propelled grenades all night, the Ukrainian garrison was pounded with 120 mm mortar fire. North of Mariupol, Starohnativka was the target of 122m mortars, 122 mm guns and 152 mm howitzers. Ukrainian positions at Shyrokyne and Sartana, east of Mariupol, were also hit by 152 mm rounds. Around Donetsk city, 120 mm mortar rounds landed in Avdiivka and Opytne. South of Artemivsk, mortar volleys fell on Troitske. According to military spokesman Andriy Lysenko one Ukrainian soldier was wounded in action in the Donbass region during the last 24 hours. The casualty occurred in Zolote, Luhansk Oblast. The Ukrainian army reported 82 violations of the truce by the militias on the previous day. Rebel troops used banned heavy weapons on 59 occasions by firing mortar, artillery, and "Grad" multiple rocket barrages. Around Donetsk city, 120 mm mortar rounds landed in Avdiivka, Opytne, Verkhnotoretske and Troitske. Ukrainian redoubts near Krasnohorivka were hit by small arms, roket propelled grendes, mortars and 152 mm artillery fire. The rebel howitzers also fired at Avdiivka and Slavne. Residential neighborhoods in Avdiivka were rocked by the explosions of 122 mm artillery shells. South of Artemivsk, "Grad" artillery rockets launched from Olkhovatka landed in Troitske. Sanzharivka, Lozove, Luhanske and Troitske were the target of 122 mm artillery guns. Novozvanivka, Zaitseve and Zolote were fired at with 120 mm mortars. In the northern front, pro-Russian tanks from Smile attacked Trokhizbenka, firing a total of 82 rounds on the Ukrainian stronghold. A thick column of smoke was seen rising from the town. The separatists fired automatic grenade launchers, antitank rockets, mortars and self-propelled artillery on Ukrainian positions around Stanitsya Luhanska. The Ukrainian army returned fire, and the engagement continued well into the early hours of the day. Bolotene was shelled with 152 mm howitzers. In Mariupol's region, 120 mm mortar rounds hit Bohdanivka. By evening, rebel forces had again broke the Minsk agreements regarding heavy weapons in a number of occasions. West of Donetsk city, Opytne was shelled with 120 mm mortars and the contested Maryinka with 152 mm howitzers. Early in the morning, Ukrainian troops near Maryinka was also the target of small arms, rocket propelled grenades and mortar fire. In the northern front, 120 mm mortar rounds landed in Svitlychne, Shchastya and Novotoshkivka, while Trokhizbenka was pounded by 120 mm mortars and 152 mm howitzers. The militias also used 120 mm mortars to shell Luhanske and Maiorsk, in the region south of Artemivsk. At mid-morning, armoured fighting vehicles attacked the Ukrainian garrison at Shyrokyne, east of Mariupol, supported by rocket propelled grenades. President Poroshenko, speaking at a ceremony to mark 24 years of Ukrainian independence from its former Soviet ruler, said that 50,000 Russian troops were massed along the Ukraine-Russia border and a further 9,000 were supporting pro-Russian rebels in separatist territories. Russia has dismissed accusations by NATO and other powers that it has sent arms and troops to back separatists in the east. According to military spokesman Oleksandr Motuzyanyk two Ukrainian soldiers were killed in action and nine others wounded in the Donbass region during the last 24 hours. The Ukrainian army reported 77 violations of the cease-fire by the militias during the same period of time. Around Donetsk city, Krasnohorivka was under mortar fire on three occasions. Pro-Russian forces attacked Opytne with small arms, antiaircraft cannons and tanks. Ukrainian authorities claimed that the rebels shelled residential buildings in Krasnohorivka and Avdiivka with 122 mm artillery and 120 mm mortars. In the northern front, Ukrainian outposts at Shchastya were hit by mortar fire. Late in the night, Ukrainian troops in the area south of Artemivsk were harassed with small arms fire in Sanzharivka, Maiorsk, Luhanske and Troitske. In the very early hours of the day, two Ukrainian marines were killed and three wounded by 122 mm artillery fire in the Ukrainian stronghold of Sopino, 16 km east of Mariupol's center. The village of Lebedynske was shelled by pro-Russian forces in Kominterove with the same kind of weapon. Some hours later Hranitne, in the northern part of Mariupol's region, became the target of 120 mm mortar rounds. Separatist officials said the Ukrainian army launched an ill-fated assault during the evening on Bila Kamyanka, east of Starohnativka, supported by automatic weapons, antitank rockets and antiaircraft cannons. South of Artemivsk, rebel troops entrenched in Vuhlerivsk poured 152 mm artillery rounds on the village of Luhanske. Stepne was attacked with 120 mm mortar fire. Heavy 120 mm mortar rounds also landed in Popasna, in the northern front. In the surroundings of Donetsk city, the militias shelled Vodiane with 122 mm artillery fire. Ukrainian redoubts at Opytne were fired at by small arms, heavy machine guns, rocket propelled grenades and mortars. The rebels used 152 mm howitzers to bombard Krasnohorivka during half-an-hour. Later, the same location was targeted by 120 mm mortars and antiaircraft artillery. Two Ukrainian soldiers were killed in action and ten others wounded in the Donbass region during the last 24 hours. The militias broke the ceasefire on 92 occasions over the same period. The militias made widespread use of banned heavy weapons, particularly in the area west of Donetsk city. Pisky and Opytne were shelled with 120 mm mortars, while 122 mm artillery rounds hit Avdiivka. Civilian property was damaged. Ukrainian outposts near Troitske were the target of rocket propelled grenades and 152 mm howitzers. Rebel 122 mm artillery shelled Maryinka and Novoselivka, and pro-Russian armoured fighting vehicles opened fire on Ukrainian troops in Krasnohorivka and Opytne. In Mariupol's region, Starohnativka was the target of mortar volleys three times before midnight. At dusk, Ukrainian troops drove back rebel scouts near Novotroitske. Ukrainian positions at Stanitsya Luhanska were hit by heavy machine guns, rocket propelled grenades and mortars. Gas pipelines and power lines were damaged. Separatist forces continued to break the Minsk agreements through the day. Around Donetsk city, pro-Russian tanks attacked Opytne in the early hours of the morning, supported by 120 mm mortars and 122 mm artillery. In the afternoon, civilian residences in Krasnohorivka were hit by heavy mortar barrages. South of Artemivsk, the Ukrainian garrison at Zaitseve was shelled with 152 mm howitzers. The Ukrainian stronghold of Luhanske was hit by 120 mm mortar and 122 mm artillery volleys. Ukraine and pro-Russian separatists agreed to strive for an end to all truce violations from next Tuesday, 1 September, to mark the beginning of the school year in Ukraine. Seven Ukrainian servicemen were killed in action and 13 others wounded in the Donbass region during the last 24 hours. Most of the casualties occurred near Maryinka and Mariupol, Donetsk Oblast. The casualties were the highest daily losses for the Ukrainian army since mid-July. Ukrainian officials claimed to have destroyed a rebel ammunition depot and four armoured vehicles at Styla, north of Mariupol, in retaliation for the heavy casualties inflicted by the militants. Fifty-one pro-Russian troops were allegedly wounded. The Ukrainian army reported 90 violations of the ceasefire during the same period. Separatist media reported that Ukrainian tanks shelled the small town of Raivka, on the southern bank of the Seversky Donets. Five Ukrainian servicemen were wounded in the Donbass region during the last 24 hours. The casualties occurred in the adjoining area of Donetsk airfield. The Ukrainian military recorded 109 violations of the ceasefire by the militias during the same period of time. In Mariupol's region, the militias shelled Novohryhorivka and Starohnativka with 122 mm artillery. Forward observation posts at Starohnativka were also the target of 120 mm mortar fire. In the area around Donetsk city, rebel forces poured small arms fire, 120 mm mortar rounds, 122 mm artillery and "Grad" multiple rocket volleys at Ukrainian positions in Opytne. Civilian areas of Avdiivka were rocked by the explosions of 122 mm shells. In the northern front, mortar rounds landed in Stanitsya Luhanska, Stari Aidar and Trokhizbenka. Artillery fire hit Orikhove, while the village of Troitske was attacked with automatic grenade launchers. The Ukrainian officer in charge of a mortar battery at Shchastya was wounded by hostile mortar fire. In the course of the day pro-Russian tanks attacked Hranitne, north of Mariupol, supported by 120 mm mortar fire. Around Donetsk city, Ukrainian positions at Krasnohorivka, Opytne, Pisky and Maryinka were the target of small arms fire and mortars. Residential areas of Avdiivka were hit by 120 mm mortar rounds and 122 mm artillery fire. Ukrainian outposts around Stanitsya Luhanska, in the northern front, were pounded by rocket propelled grenades and mortars. Heavy 120 mm mortar rounds landed in the Ukrainian strongholds of Sanzharivka, Troitske and Kirove, south of Artemivsk. According to military spokesman Oleksandr Motuzyanyk two Ukrainian soldiers were killed in action and three others wounded in the Donbass region during the last 24 hours. The militias broke the ceasefire on 74 occasions over the same period. The violations also included the use of banned heavy weapons. Around Donetsk city, rebel forces from Spartak attacked Ukrainian positions in Avdiivka with small arms, rocket propelled grenades, 82 mm and 120 mm mortars. South of Artemivsk, 120 mm mortar rounds landed in Sanzharivka. North of Mariupol, a ten-men strong group of militiamen attempted to break through the Ukrainian lines near Bohdanivka with the support of small arms fire and armoured fighting vehicles. In the northern front, automatic grenade launcher and mortar fire was reported in Stanitsya Luhanska. Two Ukrainian soldiers were wounded when an improvised explosive device went off near Krimsky. Sporadic violations took place throughout the day. Pro-Russian militias opened fire with small arms on Ukrainian troops at Shchastya, in the northern front, Opytne and Butivka mining complex, west of Donetsk city. Ukrainian outposts were the target of heavy machine gun fire at Luhanske, south of Artemivsk, and Shyrokyne, east of Mariupol. Luhanske was also hit by rocket propelled grenades in the afternoon. According to military spokesman Andriy Lysenko one Ukrainian serviceman was wounded in action in the Donbass region during the last 24 hours. The casualty occurred near Shchastya, Luhansk Oblast. The militias broke the ceasefire on 19 occasions over the same period, according to Ukrainian authorities. Rebel officials said Ukrainian forces opened fire on separatist troops on 15 occasions. The Ukrainian army reported no violations of the Minsk agreements regarding heavy weapons. There were only attacks on Ukrainian positions involving small arms, rocket propelled grenades and 82 mm mortars. Around Donetsk city, rebel troops fired rocket propelled grenades at Ukrainian positions near Avdiivka and Maryinka. The Ukrainian garrison at Opytne received small arms fire. In the northern front, Trokhizbenka was the target of rocket propelled grenades, while Ukrainian troops at Krimsky were shelled with 82 mm mortars. Ukrainian outposts around Shchastya were harassed with small arms fire. Rocket propelled grenades also landed in the Ukrainian strongholds of Luhanske, south of Artemivsk, and Svetlodarsk. Leninske was fired at by rebel Zu-23-2 antiaircraft cannons. East of Mariupol, the militias opened heavy machine gun fire on Shyrokyne. This day marked the lowest number of incidents over the past four months. Throughout the day the Ukrainian military only recorded small arms attacks on Opytne and heavy machine gun fire near Pisky, and small arms fire combined with rocket propelled grenades at Lozove. Five Ukrainian soldiers were wounded in action in the Donbass region during the last 24 hours. The militias launched 16 attacks on Ukrainian troops during the same period of time. The main violations of the truce took place in Pisky and Butivka mining complex, where the rebel forces fired rocket propelled grenades at the Ukrainian positions. South of Artemivsk, small arms fire raked Ukrainian outposts at Leninske and Kirove. The militias attacked the Ukrainian garrison at Luhanske with heavy machine guns. By evening the silent mode had held along the demarcation line. The exceptions were a small arms attack on Ukrainian troops in Krimsky, in the northern front, harassing fire on Ukrainian positions at Maryinka, using small arms, heavy machine guns and rocket propelled grenades, and an incident also involving small arms and rocket propelled grenades at Avdiivka. A drone belonging to the OSCE mission was lost near Sontseve while checking concentrations of separatist heavy weapons across Mariupol's region. Members of the Donetsk People's Republic army prevented the access of an OSCE patrol to the area. The Ukrainian military reported no casualties for the last day of August. The militias broke the ceasefire on 19 occasions over the same period. Converserly, pro-Russian officials recorded seven Ukrainian violations of the truce using small arms, 82 mm mortars, 120 mm mortars and tanks. The Ukrainian military did not report any use of banned heavy weapons by the militias. Small arms attacks were, however, recorded in Maryinka, Opytne and Avdiivka, in the surroundings of Donetsk city. Ukrainian troops at Avdiivka were also the target of rocket propelled grenades. South of Artemivsk, Ukrainian positions at Sanzharivka and Lozove were harassed with small arms and heavy machine gun fire. In the northern front, militiamen from Sokolniki attacked Ukrainian outposts at Krimsky using small arms fire. Only sporadic violations of the ceasefire occurred through the day. In the northern front, 82 mm mortar rounds landed in Shchastya at dawn. Around Donetsk city, the rebels fired small arms at Ukrainian outposts in Maryinka. Small arms and automatic grenade launchers were also fired at Avdiivka. In Sanzharivka, south of Artemivsk, the militias fired small arms and rocket propelled grenades on Ukrainian entrenchments. According to military spokesman Andriy Lysenko one Ukrainian serviceman was wounded in action in the Donbass region during the last 24 hours. The casualty occurred near Krimsky, Luhansk Oblast. The Ukrainian army recorded five attacks on Ukrainian troops during the same period of time. In the morning at around 07:00 am a group of Ukrainian servicemen were ambushed near Lobacheve, Luhansk Oblast. One of the vehicles they were riding struck a landmine, then came under sniper fire. Two servicemen were killed and six others wounded. The attackers fled by crossing the Seversky Donets. By evening, the militias had broken the ceasefire in other areas of the northern front. Ukrainian positions around Novotoshkivka were the target of 120 mm mortar rounds, while at Krimsky and Shchastya Ukrainian troops received small arms fire. West of Donetsk city, rebel troops attacked Avdiivka with small arms and rocket propelled grenades. According to military spokesman Oleksandr Motuzyanyk two Ukrainian servicemen were killed and six others wounded in action in the Donbass region during the last 24 hours. All the casualties occurred near Lobacheve, Luhansk Oblast. The militias broke the ceasefire on 10 occasions over the same period. Small arms fire was recorded near Maryinka, and Ukrainian troops at Krasnohorivka received heavy machine gun fire from Staromyhailivka. OSCE reported artillery or mortar fire south-west of rebel-held Horlivka, plus five violations of the truce around Donetsk city. The commander of a company of the Ukrainian 80th brigade was killed today near the site of the ambush at Lobacheve when he stepped on a landmine. Pro-Russian troops from Yasinuvata launched an attack with small arms on Ukrainian positions at Avdiivka. Earlier, militias from Sokolniki had launched rocket propelled grenades on the Ukrainian stronghold of Krimsky. One Ukrainian serviceman was confirmed killed in action in the Donbass region during the last 24 hours. The Ukrainian army recorded five attacks on Ukrainian troops during the same period. In the outskirts of Donetsk city, the rebels attacked Ukrainian positions west and south of Avdiivka with small arms and rocket propelled grenades. Opytne was the target of 82 mm mortar rounds. In the area of Bakhmutka road, in the northern front, the militias fired antitank rockets on Ukrainian positions at Krimsky for half an hour. By evening, pro-Russian forces had broken the truce on six occasions, most of them around Donetsk city. Early in the morning, Ukrainian troops at Opytne received small arms fire, and outposts around nearby Maryinka were attacked with automatic weapons and rocket propelled grenades throughout the afternoon. Rocket propelled grandes also landed in Avdiivka. Ukrainian troops at Shchastya, in the northern front, were harassed with small arms fire. According to military spokesman Andriy Lysenko two Ukrainian soldiers were wounded in the Donbass region during the last 24 hours. The casualties occurred north of Horlivka, Donetsk Oblast, where the servicemen were wounded by improvised explosive devices. The Ukrainian army recorded 19 violations of the ceasefire by the militias during the same period. Eighteen of these violations took place west of Donetsk city. According to military spokesman Oleksandr Motuzyanyk five Ukrainian soldiers were wounded in action in the Donbass region during the last 24 hours. The militias broke the ceasefire on 14 occasions over the same period, according to Ukrainian authorities. Ukrainian outposts at Maryinka and Avdiivka, west of Donetsk city, were the target of rocket propelled grenades. South of Artemivsk, rebel forces harassed Ukrainian troops at Zaitseve with small arms fire. There were sporadic violations of the truce throughout the day. Early in the morning, Ukrainian positions near Luhanske, south of Artemivsk, received small arms fire. The militias also poured small arms fire three times on Ukrainian troops at Maryinka, west of Donetsk city. The separatists also fired rocket propelled grenades at Shchastya, in the northern front. East of Mariupol rebel troops from Kominternove attacked a Ukrainian observation post at Talakivka with automatic weapons. According to military spokesman Andriy Lysenko two Ukrainian servicemen were wounded in the Donbass region during the last 24 hours. Two Ukrainian soldiers were killed near Volnovakha by a fellow serviceman, who stole their weapons. The killer was arrested by Ukrainian authorities shortly after. The Ukrainian army recorded 12 attacks on Ukrainian troops during the same period. In the area west of Donetsk city, pro-Russian armoured fighting vehicles attacked Ukrainian positions at Maryinka and avdiivka, supported by small arms fire and rocket propelled grenades. South of Artemivsk, Ukrainian troops at Kirove received small arms fire, and a rebel sniper was active in Zaitseve. A Ukrainian patrol found the dead bodies of five rebel scouts in a minefield near the Seversky Donets. By evening, the ceasefire had been strictly observed along the demarcation line for the first time in months. According to military spokesman Oleksandr Motuzyanyk one Ukrainian soldier was killed and two others were wounded in action in the Donbass region during the last 24 hours. All the casualties occurred in an afternoon battle that took place between the villages of Novokyivka and Syze, that are situated not far from the Ukrainian-Russian border, in Luhansk Oblast. A second Ukrainian serviceman was confirmed killed later in the day. The casualties belonged to the 128th Infantry Brigade. The militias broke the ceasefire on three occasions over the same period. According to Ukrainian Defence Minister Stepan Poltorak fighting in eastern Ukraine has fallen to its lowest level since the conflict started. The Ukrainian military recorded only one violation of the ceasefire throughout the day, when a group of ten militiamen attempted to infiltrate through the Ukrainian lines in Luhansk Oblast. The UN human rights office on Tuesday reported at least 7,962 people had been killed and at least 17,811 have been injured since fighting broke out in eastern Ukraine in mid-April 2014. According to military spokesman Andriy Lysenko one Ukrainian soldier was killed in action in the Donbass region during the last 24 hours. The fatality occurred near the village of Syze where government forces were engaged in a battle with a reconnaissance-diversionary militia unit that had crossed the Siverskyi Donets at night. The Ukrainian military recorded four attacks on their troops during the same period. No violations of the ceasefire were recorded during the first six hours of 9 September. Overnight, the militias fired at a Ukrainian observation post near Luhanske, in the area south of Artemivsk. In the northern front, rocket propelled grenades landed around Ukrainian positions in Shchastya. West of Donetsk city, pro-Russian forces from Spartak attacked Avdiivka with small arms, heavy machine guns, rocket propelled grenades and armoured fighting vehicles. In the course of the day, a Ukrainian Border Guard checkpoint near Novotroitske, Donetsk Oblast, was the target of mortar fire; a "Cougar" armoured vehicle was damaged and the traffic through the demarcation line was temporarily suspended. At dawn, Ukrainian troops at Shchastya were harassed with small arms fire and rocket propelled grenades. Separatist troops used an automatic grenade launcher to attack Ukrainian positions at Novomarivka, near Donetsk city. According to military spokesman Oleksandr Motuzyanyk one Ukrainian soldier was wounded in action in the Donbass region during the last 24 hours. A woman was wounded by explosion of an improvised explosive device in Stanytsia Luhanska, Luhansk Oblast. The militias broke the ceasefire on two occasions over the same period. No violations of the ceasefire were recorded during the first six hours of 10 September. During the morning, the explosion of another improvised explosive device killed two Ukrainian soldiers and wounded five near Troitske, south of Popasna. No other ceasefire violations were reported by the Ukrainian military throughout the day. Two Ukrainian servicemen were killed and four others wounded in the Donbass region during the last 24 hours. For the first time over several months the Ukrainian army recorded no violations of the ceasefire by pro-Russian forces on 10 September. No violations of the ceasefire were recorded during the first six hours of 11 September either. By evening the Ukrainian military had reported two attacks on Ukrainian positions by pro-Russian forces. At noon, a Ukrainian outpost south of Avdiivka received small arms fire and rocket propelled grenades. One Ukrainian soldier was wounded as a result. The nearby village of Opytne was the target of machine gun fire and rocket propelled grenades some hours later. One Ukrainian serviceman was wounded in the Donbass region during the last 24 hours. The casualty occurred at Butivka mining complex, near Donetsk airfield. The Ukrainian military recorded five attacks on their troops during the same period. No violations of the ceasefire were recorded during the first six hours of 12 September. The militias used again small arms, heavy machine guns and rocket propelled grenades to harass Ukrainian troops at Avdiivka and Opytne, west of Donetsk city. Throughout the day, the Ukrainian military recorded just one violation of the truce by the militias, when rebel scouts attempted to break through the Ukrainian lines in the northern front near Syze, Luhansk Oblast. Ukrainian forces repelled the assault. One Ukrainian serviceman was wounded in the Donbass region during the last 24 hours. The casualty occurred near Maryinka, Donetsk Oblast. The militias broke the ceasefire on three occasions over the same period, according to Ukrainian authorities. No violations of the ceasefire were recorded during the first six hours of 13 September. Most violations occurred in the area south of Artemivsk, where Ukrainian outposts in Zaitseve were attacked with heavy machine gun fire. Ukrainian positions at Travneve were harassed with small arms fire. Throughout the day, pro-Russian forces opened fire again on Ukrainian positions south of Artemivsk and in the area around Donetsk city. Forward Ukrainian positions at Zaitseve were the target of small arms fire, while Ukrainian troops at Luhanske received heavy machine gun fire. A rebel sniper was active at Maryinka, in the surroundings of Donetsk city. Ukrainian authorities claimed that members of a separatist mechanized regiment killed three civilians in the region of Novoazovsk caused by the mishanding of firearms and alcohol abuse. Two Ukrainian soldiers were killed, one missing in action and other two wounded over the past 24 hours. There were eight attacks on Ukrainian positions during the same period, at least one of them involving the use of heavy weapons. Forward Ukrainian outposts north of Lozove, south of Artemivsk, were hit by small arms, heavy machine guns and rocket propelled grenades. In the northern front, Shchastya was attacked with automatic grenade launchers, while mortar rounds landed among Ukrainian troops deployed south of Sokolniki. The Ukrainian military reported a number of ceasefire violations in the area south of Artemivsk. In the afternoon, pro-Russian forces opened fire on Ukrainian troops around Zaitseve with small arms and sniper fire. The Ukrainian garrison at Lozove received heavy machine gun fire, and Ukrainian positions at Sanzharivka were the target of small arms. Two Ukrainian servicemen were wounded in action in the Donbass region during the last 24 hours. Two civilians were injured by an explosion of improvised explosive device in Hranitne, north of Mariupol. For the first time in 16 months no attacks against Ukrainian forces were recorded in the outskirts of Donetsk city. The Ukrainian army recorded seven attacks on Ukrainian troops during the same period. Most of the violations took place south of Artemivsk, where Ukrainian troops deployed at Maiorsk were the target of small arms, heavy machine guns and rocket propelled grenades. Ukrainian positions at Sanzharivka and Lozove received small arms fire. The Ukrainian military reported an intensification of the incidents across the frontline by evening. Early in the morning, pro-Russian forces harassed the Ukrainian garrison at Krimsky, in the northern front, with small arms fire. In the afternoon, Ukrainian troops near Zholobok received automatic fire from rebel positions. In the area of Mariupol, 82 mm mortar volleys struck Chermalik, and rocket propelled grenades were fired on Hnutove. West of Donetsk city, the militias fired small arms, rocket propelled grenades and antiaircraft cannons at Ukrainian positions in Maryinka. A Ukrainian outpost at Luhanske, south of Artemivsk, was raked with small arms fire by rebel troops. According to military spokesman Andriy Lysenko two Ukrainian soldiers were wounded in action in the Donbass region during the last 24 hours. The militias broke the ceasefire on nine occasions over the same period, according to Ukrainian authorities. No violations of the ceasefire were recorded during the first six hours of 16 September. The main target of the militias was Krimsky, in the northern front, where rebel snipers harassed Ukrainian positions from the south. One Ukrainian soldier there was wounded by an improvised explosive device. Ukrainian troops at Roszadky and Luhanske, south of Artemivsk, received harassing fire from intruders armed with small arms. A Ukrainian border guard outposts at Maryinka was the target of intense small arms and mortar fire from rebel-held Olevsandrivka. No hostile incidents were reported by the Ukrainian military in the course of the day. The Ukrainian military reported no casualties in the Donbass region during the last 24 hours. The Ukrainian army recorded three attacks on Ukrainian troops during the same period. No violations of the ceasefire were recorded during the first six hours of 17 September. Two Ukrainian servicemen were wounded at around 12:30 pm by grenade launcher fire in Valuiske, Luhansk Oblast. At around 14:00 pm three militiamen were wounded South West of Horlivka, Luhansk Oblast, during the process of planting mines. At evening, pro-Russian tanks shelled a neighbourhood at Krasnohorivka. No civilian casualties were reported. According to military spokesman Andriy Lysenko two Ukrainian soldiers were killed and other five wounded in the Donbass region, most of them by explosive improvised devices during the last 24 hours. The militias broke the ceasefire on one occasion over the same period. The incident took place at Lozove, south of Artemivsk, where a forward outpost manned by Ukrainian troops received small arms fire. The Ukrainian military said that the militias fired on Ukrainian positions at least on two occasions throughout the day. in the early hours of the day, antiaircraft cannons executed direct fire from the rebel-held city of Horlivka. In the afternoon, 82 mm mortar rounds landed twice in the outskirts of Shyrokyne. One Ukrainian soldier was killed and another wounded in the Donbass region during the last 24 hours. The casualties were caused by explosive improvised devices near Bolotene, Luhansk Oblast. The Ukrainian army recorded three violations of the ceasefire by the militias during the same period. No violations of the ceasefire were recorded during the first six hours of 19 September. By evening the Ukrainian military had recorded no violations of the truce by separatist forces. The Ukrainian military reported no casualties in the Donbass region during the last 24 hours. The militias broke the ceasefire on two occasions over the same period, according to Ukrainian authorities. No violations of the ceasefire were recorded during the first six hours of 20 September. During the previous night, Ukrainian forward positions at Bohdanivka, north of Mariupol, were harassed with small arms fire. Some hours later, Ukrainian troops deployed south of Avdiivka were the target of small arms, rocket propelled grenades and antiaircraft cannons. Heavy machine gun fire was heard at midnight in the area south of Artemivsk. Two violations of the ceasefire were reported by the Ukrainian military throughout the day. The first took place at mid-morning when pro-Russian forces fired small arms and rocket propelled grenades on the Ukrainian stronghold of Luhanske, south of Artemivsk. In the same area, Ukrainian troops at Maiorsk received automatic fire during the afternoon. One Ukrainian soldier was killed and other two wounded in the Donbass region during the last 24 hours. Two of the casualties took place in the northern front -Luhansk Oblast- and another south of Artemivsk. All were the result of improvised explosive devices. One Ukrainian soldier from the 92nd mechanized brigade was killed and another wounded near Novotoshkivka, the second wounded was injured near Svetlodarsk. The Ukrainian army recorded four attacks on Ukrainian troops during the same period. The Ukrainian army reported no attacks on their troops throughout the day. The Ukrainian military reported no casualties in the Donbass region during the last 24 hours. Pro-Russian forces broke the ceasefire on three occasions over the same period of time. Two incidents occurred south of Artemivsk, where the militias harassed Ukrainian positions with small arms fire at Kirove and with heavy machine gun fire at Maiorsk. Ukrainian troops at Zolote, in the northern front, also received small arms fire combined with rocket propelled grenades. No incidents had been recorded by the Ukrainian military by evening. The Ukrainian military reported no casualties in the Donbass region during the last 24 hours. Nine violations of the ceasefire were recorded by the Ukrainian army during the same period; no violations of the ceasefire were recorded during the first six hours of 23 September. Most incidents happened in the area south of Artemivsk. The militias attacked Zaitseve, Luhanske, Lozove and Maiorsk with small arms -including sniper fire- and rocket propelled grenades. Rebel troops from Sokolniki, in the northern front, also fired rocket propelled grenades just before midnight. According to military spokesman Andriy Lysenko one Ukrainian soldier was killed in action and other two wounded during the last 24 hours in the Donbass region. The casualties were the consequence of the explosion of a landmine on Bakhmutka road. The Ukrainian army recorded four violations of the ceasefire on 23 September and two attacks against Ukrainian forces during the first six hours of 24 September. During the past night, the militias engaged three times the Ukrainian garrison at Krimsky, in the area of Bakhmutka road, with small arms fire. A Ukrainian patrol was also the target of automatic fire near Zolote, in the northern front. In the early hours of the morning, rebel forces fired small arms and heavy machine guns on Ukrainian positions at Zaitseve, south of Artemivsk. Pro-Russian artillery from Staromyhailivka shelled Ukrainian troops deployed at Krasnohorivka, west of Donetsk city, with 122 mm guns. The Ukrainian military reported other two attacks on their troops throughout the day, carried out by pro-Russian snipers near Popasna. A ten-year-old girl was killed and several other civilians were injured during a military event in Torez, Donetsk Oblast. Pro-Russian media dubbed the incident a "terrorist attack". One Ukrainian soldier was wounded in action in the Donbass region during the last 24 hours. The casualty occurred in Avdiivka, Donetsk Oblast. Officials from Luhansk Oblast claimed that the explosion of an antipersonal device near Krymske killed one and wounded another two soldiers, in Orikhove four servicemen from the 22nd mechanized brigade were wounded. The Ukrainian army recorded four violations of the ceasefire on 24 September and one violation during the first six hours of 25 September. Local authorities in Mariupol claimed to have witnessed a show of force of minor units of the Russian Black Sea Fleet off Bilosaraiska bay, west of the city. By evening, the Ukrainian military had recorded just one attack on their troops at Zaitseve, south of Artemivsk. Pro-Russian forces fired small arms and rocket propelled grenades on Ukrainian positions there. OSCE Special Monitoring Mission (SMM) to Ukraine reported the presence of heavy multiple launch thermobaric rocket system (TOS-1 Buratino, 220mm) at the training area in "LPR"-controlled Kruhlyk (31 km south-west of Luhansk). According to military spokesman Andriy Lysenko no Ukrainian soldiers were killed or wounded in action in the Donbass region during the last 24 hours. The Ukrainian military reported eight violations of the ceasefire by the militias, four of them direct attacks on Ukrainian positions. Most of the incidents occurred in the area south of Artemivsk. Rebel snipers were active at Zaitseve last evening. Some hours later, Ukrainian troops there were the target of small arms fire and rocket propelled grenades. Small arms fire was also heard near Troitske, and rocket propelled grenades landed around Ukrainian outposts in Leninske and Kirove. According to military spokesman Oleksandr Motuzyanyk one Ukrainian serviceman was killed and another wounded by a landmine explosion in the Donbass region during the last 24 hours.The fatalities occurred in the area around Horlivka. Three ceasefire violations were recorded by the Ukrainian army on 26 September and during the first six hours of 27 September. All the incidents took place in the area south of Artemivsk, where pro-Russian forces used small arms and sniper fire to harass Ukrainian positions at Lozove and rocket propelled grenades on Ukrainian positions at Troitske. According to military spokesman Andriy Lysenko four Ukrainian soldiers were wounded in the Donbass region during the last 24 hours. The casualties occurred near Maryinka, Donetsk Oblast. The Ukrainian army recorded three attacks against their positions on 27 September, no ceasefire violations were recorded during the first six hours of 28 September. Pro-Russian forces fired heavy machine guns and rocket propelled grenades on Ukrainian troops at Maryinka for about an hour, resulting in the four casualties reported by the Ukrainian military. In the area of Mariupol, the militias fired rocket propelled grenades on Novotroitske. The attack was apparently carried out by rebel scouts who slipped through the Ukrainian lines. South of Artemivsk, Ukrainian positions at Maiorsk received small arms fire, and a heavy machine gun attack was recorded at Luhanske. The Ukrainian military reported no casualties in the Donbass region during the last 24 hours. Two civilians were injured and hospitalised in Dzerzhynsk, Donetsk Oblast. The Ukrainian army reported five ceasefire violations on 28 September, no violations of the ceasefire were recorded during the first six hours of 29 September. South of Artemivsk, a Ukrainian forward outpost near Zaitseve was the target of small arms fire and rocket propelled grenades. Small arms were also fired on Ukrainian troops at Travneve, while in Maiorsk, militias used heavy machine gun fire and rocket propelled grenades to harass Ukrainian positions. In the northern front, Ukrainian forces at Stari Aidar received small arms fire. In the course of the day, pro-Russian forces continued their low-intensity activity in the area south of Artemivsk. At dawn, the Ukrainian garrison at Maiorsk was once again the target of heavy machine gun fire and rocket propelled grenades. During the morning, rebel scouts attempted to break through the Ukrainian positions in the area of Zaitseve, but were driven back after almost two hours of fighting. Meantime, Ukrainian troops at Lozove received heavy machine gun fire. According to the Information Resistance the weaponry of the National Guard of Ukraine has been supplemented by semi-automatic anti-materiel rifles Barrett M107A1. According to military spokesman Andriy Lysenko one Ukrainian serviceman was wounded in the Donbass region during the last 24 hours. The casualty occurred in the course of demining activities between Artemivsk and Horlivka, Donetsk Oblast. Overnight, pro-Russian forces attacked for almost three hours the Ukrainian garrison at Krasnohorivka, west of Donetsk city. The rebels used small arms, heavy machine guns and armoured fighting vehicles, Ukrainian troops fired back with automatic weapons. The Ukrainian army recorded four attacks against their positions during 29 September, no violations of the ceasefire were recorded during the first six hours of 30 September. In the course of the morning, the militias harassed Ukrainian positions at Novotroitske, in the area of Mariupol, with small arms fire. Donetsk People's Republic deputy defence minister Eduard Basurin claimed that two Ukrainian servicemen defected to the separatist side near Horlivka. ^ "Зведені дані щодо ситуації у зоні АТО – 01 липня" (in Ukrainian). NSDC. 1 July 2015. Retrieved 1 July 2015. ^ "Сводные данные по ситуации в зоне АТО – 01 июля" (in Russian). NSDC. 1 July 2015. Retrieved 1 July 2015. ^ "SUMMARY INFORMATION FROM АТО – 01.07.2015 (VIDEO)". NSDC. 1 July 2015. Retrieved 1 July 2015. ^ "За сутки на Донбассе погиб один воин АТО, еще 10 были ранены террористами" (in Russian). Information Resistance. 1 July 2015. Retrieved 1 July 2015. ^ "One Soldier Killed, 10 Hurt In Eastern Ukraine". REF/RL. 1 July 2015. Retrieved 1 July 2015. ^ "Боевики обстреливали позиции сил АТО на подступах к Мариуполю". Retrieved 1 July 2015. ^ "Ukrainian Armed Forces pounded the territory of the DPR with more than 200 mines in 24 hours – Basurin". Retrieved 2 July 2015. ^ "В течение дня боевики около 20 раз обстреляли позиции сил АТО". Retrieved 2 July 2015. ^ "Зведені дані щодо ситуації у зоні АТО – 02 липня" (in Ukrainian). NSDC. 2 July 2015. Retrieved 2 July 2015. ^ "Сводные данные по ситуации в зоне АТО – 02 июля" (in Russian). NSDC. 2 July 2015. Retrieved 2 July 2015. ^ "SUMMARY INFORMATION FROM АТО – 02.07.2015 (VIDEO)". NSDC. 2 July 2015. Retrieved 2 July 2015. ^ "DPR Army units were withdrawn from Shirokino – Basurin". Retrieved 2 July 2015. ^ "Несмотря на заявления о демилитаризации, боевики продолжили обстреливать Широкино". Retrieved 2 July 2015. ^ "Пресс-центр АТО констатирует уменьшение интенсивности обстрелов боевиками позиций военных". Retrieved 3 July 2015. ^ "Зведені дані щодо ситуації у зоні АТО – 03 липня" (in Ukrainian). NSDC. 3 July 2015. Retrieved 3 July 2015. ^ "Сводные данные по ситуации в зоне АТО – 03 июля" (in Russian). NSDC. 3 July 2015. Retrieved 3 July 2015. ^ "SUMMARY INFORMATION FROM АТО – 03.07.2015 (VIDEO)". NSDC. 3 July 2015. Retrieved 3 July 2015. ^ "Карта боев в Донбассе: ситуация на 3 июля". Retrieved 4 July 2015. ^ "Под Счастьем произошел бой, силы АТО вновь дали отпор оккупантам". Retrieved 4 July 2015. ^ "Зведені дані щодо ситуації у зоні АТО – 04 липня" (in Ukrainian). NSDC. 4 July 2015. Retrieved 4 July 2015. ^ "Сводные данные по ситуации в зоне АТО – 04 июля" (in Russian). NSDC. 4 July 2015. Retrieved 4 July 2015. ^ "SUMMARY INFORMATION FROM АТО – 04.07.2015 (VIDEO)". NSDC. 4 July 2015. Retrieved 4 July 2015. ^ "За сутки боевики 37 раз открывали огонь по силам АТО - штаб". Retrieved 6 July 2015. ^ "Ситуация в зоне АТО: 20 обстрелов, новые провокации и бои". Retrieved 6 July 2015. ^ "Зведені дані щодо ситуації у зоні АТО – 05 липня" (in Ukrainian). NSDC. 5 July 2015. Retrieved 5 July 2015. ^ "Сводные данные по ситуации в зоне АТО – 05 июля" (in Russian). NSDC. 5 July 2015. Retrieved 5 July 2015. ^ "SUMMARY INFORMATION FROM АТО – 05.07.2015 (VIDEO)". NSDC. 5 July 2015. Retrieved 5 July 2015. ^ "Five Ukrainian Soldiers Killed In East". REF/RL. 5 July 2015. Retrieved 5 July 2015. ^ "За сутки в зоне АТО погибли 5 наших бойцов, еще 10 – ранены, - спикер АТО". Information Resistance. 5 July 2015. Retrieved 6 July 2015. ^ "За сутки на Луганщине погибли 3 украинских военных, 4 ранены". Retrieved 5 July 2015. ^ "На "Бахмутке" от подрыва мины погибли 3 бойца АТО, еще 3 - ранены, - МВД". Information Resistance. 5 July 2015. Retrieved 6 July 2015. ^ "ПРЕС-РЕЛІЗ ПРО НАЙБІЛЬШ РЕЗОНАНСНІ КРИМІНАЛЬНІ ПРАВОПОРУШЕННЯ ТА ПОДІЇ СТАНОМ НА 5 ЛИПНЯ 2015 РОКУ" (in Ukrainian). GUMVS. 5 July 2015. Retrieved 6 July 2015. ^ "Боевики обстреляли позиции сил АТО вблизи Счастья, Станицы Луганской и Песок из запрещенного оружия". Retrieved 5 July 2015. ^ "Боевики в течение дня более 30 раз обстреляли позиции сил АТО". Retrieved 5 July 2015. ^ "Зведені дані щодо ситуації у зоні АТО – 06 липня" (in Ukrainian). NSDC. 6 July 2015. Retrieved 6 July 2015. ^ "Сводные данные по ситуации в зоне АТО – 06 июля" (in Russian). NSDC. 6 July 2015. Retrieved 6 July 2015. ^ "SUMMARY INFORMATION FROM АТО – 06.07.2015 (VIDEO)". NSDC. 6 July 2015. Retrieved 6 July 2015. ^ "Утром боевики обстреляли Крымское и Авдеевку - штаб АТО". Retrieved 6 July 2015. ^ "Ukrainian air defense forces down enemy drone over Sea of Azov". Retrieved 6 July 2015. ^ "Зведені дані щодо ситуації у зоні АТО – 07 липня" (in Ukrainian). NSDC. 7 July 2015. Retrieved 7 July 2015. ^ "Сводные данные по ситуации в зоне АТО – 07 июля" (in Russian). NSDC. 7 July 2015. Retrieved 7 July 2015. ^ "SUMMARY INFORMATION FROM АТО – 07.07.2015 (VIDEO)". NSDC. 7 July 2015. Retrieved 7 July 2015. ^ "На Донетчине боевики обстреливали военных из танка и минометов - штаб". Retrieved 7 July 2015. ^ "Ситуация в зоне проведения АТО обострилась – пресс-центр". Retrieved 7 July 2015. ^ "За сутки на Донбассе погибли двое бойцов АТО, 10 получили ранения". Retrieved 9 July 2015. ^ "Зведені дані щодо ситуації у зоні АТО – 08 липня" (in Ukrainian). NSDC. 8 July 2015. Retrieved 8 July 2015. ^ "Сводные данные по ситуации в зоне АТО – 08 июля" (in Russian). NSDC. 8 July 2015. Retrieved 8 July 2015. ^ "SUMMARY INFORMATION FROM АТО – 08.07.2015 (VIDEO)". NSDC. 8 July 2015. Retrieved 8 July 2015. ^ "Боевики усилили обстрелы в зоне АТО, используют запрещенное Минскими соглашениями оружие". Retrieved 9 July 2015. ^ "Ситуация в зоне АТО контролируется украинскими военными". Retrieved 9 July 2015. ^ "Зведені дані щодо ситуації у зоні АТО – 09 липня" (in Ukrainian). NSDC. 9 July 2015. Retrieved 9 July 2015. ^ "Сводные данные по ситуации в зоне АТО – 09 июля" (in Russian). NSDC. 9 July 2015. Retrieved 9 July 2015. ^ "SUMMARY INFORMATION FROM АТО – 09.07.2015 (VIDEO)". NSDC. 9 July 2015. Retrieved 9 July 2015. ^ "Боевики из "Градов" обстреляли Гранитное". Retrieved 9 July 2015. ^ a b "Ситуация в зоне АТО стабильно напряженная, эпицентром боевых действий 9 июля стала Новогригорьевка". Retrieved 10 July 2015. ^ "Внаслідок бою з диверсантами біля Станиці Луганської один український військовий загинув, один поранений" (in Ukrainian). Official site of Hennadiy Moskal. 10 July 2015. Retrieved 10 July 2015. ^ "В бою с ДРГ террористов под Станицей погиб боец АТО и получил ранение мирный житель" (in Russian). Information Resistance. 10 July 2015. Retrieved 10 July 2015. ^ "Зведені дані щодо ситуації у зоні АТО – 10 липня" (in Ukrainian). NSDC. 10 July 2015. Retrieved 10 July 2015. ^ "Сводные данные по ситуации в зоне АТО – 10 июля" (in Russian). NSDC. 10 July 2015. Retrieved 10 July 2015. ^ "SUMMARY INFORMATION FROM АТО – 10.07.2015 (VIDEO)". NSDC. 10 July 2015. Retrieved 10 July 2015. ^ "Ситуация на востоке Украины обострилась с прибытием очередного "конвоя" - штаб". Retrieved 10 July 2015. ^ "Силы АТО предотвратили прорыв диверсантов за линию разграничения вблизи Талаковки – пресс-центр". Retrieved 10 July 2015. ^ "Зведені дані щодо ситуації у зоні АТО – 11 липня" (in Ukrainian). NSDC. 11 July 2015. Retrieved 11 July 2015. ^ "Сводные данные по ситуации в зоне АТО – 11 июля" (in Russian). NSDC. 11 July 2015. Retrieved 11 July 2015. ^ "SUMMARY INFORMATION FROM АТО – 11.07.2015 (VIDEO)". NSDC. 11 July 2015. Retrieved 11 July 2015. ^ "Ситуация в зоне АТО: боевики всю ночь обстреливали окрестности Кирова и Крымского". Retrieved 13 July 2015. ^ "АТО: более 20 обстрелов позиций ВСУ, новые провокации". Retrieved 12 July 2015. ^ "Зведені дані щодо ситуації у зоні АТО – 12 липня" (in Ukrainian). NSDC. 12 July 2015. Retrieved 12 July 2015. ^ "Сводные данные по ситуации в зоне АТО – 12 июля" (in Russian). NSDC. 12 July 2015. Retrieved 12 July 2015. ^ "SUMMARY INFORMATION FROM АТО – 12.07.2015 (VIDEO)". NSDC. 12 July 2015. Retrieved 12 July 2015. ^ "Ситуация на востоке Украины снова обостряется". Retrieved 12 July 2015. ^ "unian.net/war/1099851-situatsiya-v-zone-ato-stabilno-nespokoynaya-no-kontroliruemaya-press-tsentr.html". www.unian.net. Retrieved 12 July 2015. ^ "Зведені дані щодо ситуації у зоні АТО – 13 липня" (in Ukrainian). NSDC. 13 July 2015. Retrieved 13 July 2015. ^ "Сводные данные по ситуации в зоне АТО – 13 июля" (in Russian). NSDC. 13 July 2015. Retrieved 13 July 2015. ^ "SUMMARY INFORMATION FROM АТО – 13.07.2015 (VIDEO)". NSDC. 13 July 2015. Retrieved 13 July 2015. ^ a b "Боевики обстреляли жилые кварталы Авдеевки со 122-мм гаубиц и 120-мм минометов". Retrieved 13 July 2015. ^ "Двое украинских военных подорвались на растяжке в Луганской области". Retrieved 13 July 2015. ^ a b "Боевики продолжают стрелять из артиллерии по жилым кварталам и позициям сил АТО". Retrieved 13 July 2015. ^ "Зведені дані щодо ситуації у зоні АТО – 14 липня" (in Ukrainian). NSDC. 14 July 2015. Retrieved 14 July 2015. ^ "Сводные данные по ситуации в зоне АТО – 14 июля" (in Russian). NSDC. 14 July 2015. Retrieved 14 July 2015. ^ "SUMMARY INFORMATION FROM АТО – 14.07.2015 (VIDEO)". NSDC. 14 July 2015. Retrieved 14 July 2015. ^ "Ситуация в зоне АТО за сутки обострилась, военные готовы к любому развитию событий – пресс-центр". Retrieved 14 July 2015. ^ "В Широкино и Марьинке по позициям сил АТО стрелял снайпер". Retrieved 14 July 2015. ^ "Зведені дані щодо ситуації у зоні АТО – 15 липня" (in Ukrainian). NSDC. 15 July 2015. Retrieved 15 July 2015. ^ "Сводные данные по ситуации в зоне АТО – 15 июля" (in Russian). NSDC. 15 July 2015. Retrieved 15 July 2015. ^ "SUMMARY INFORMATION FROM АТО – 15.07.2015 (VIDEO)". NSDC. 15 July 2015. Retrieved 15 July 2015. ^ "Eight Soldiers Reported Killed In East Ukraine". REF/RL. 15 July 2015. Retrieved 15 July 2015. ^ "Ukraine, rebels report deadliest fighting in over a month". Reuters. 15 July 2015. Retrieved 15 July 2015. ^ "Ситуация в зоне АТО обострилась: боевики 100 раз открывали огонь". Retrieved 15 July 2015. ^ "Диверсанты боевиков атаковали позиции военных вблизи Опытного – пресс-центр АТО". Retrieved 15 July 2015. ^ "Боевики подтянули на огневые позиции крупнокалиберную артиллерию". Retrieved 15 July 2015. ^ "Каратели обстреливают Горловку из тяжёлой артиллерии и танков". Novorossia.su. 15 July 2015. ^ "Зведені дані щодо ситуації у зоні АТО – 16 липня" (in Ukrainian). NSDC. 16 July 2015. Retrieved 16 July 2015. ^ "Сводные данные по ситуации в зоне АТО – 16 июля" (in Russian). NSDC. 16 July 2015. Retrieved 16 July 2015. ^ "SUMMARY INFORMATION FROM АТО – 16.07.2015 (VIDEO)". NSDC. 16 July 2015. Retrieved 16 July 2015. ^ "One Ukrainian servicemen killed, ten injured in Donbas over past day". KyivPost. Retrieved 17 July 2015. ^ "Боевики обстреляли из артиллерии село в Артемовском районе, есть погибшие среди мирного населения". Retrieved 16 July 2015. ^ "Террористы обстреляли из артиллерии Новотошковское". Retrieved 16 July 2015. ^ "Боевики обстреляли Авдеевку из запрещенного оружия - пресс-центр АТО". Retrieved 16 July 2015. ^ a b c "Боевики обстреливают населенные пункты из танков и минометов". Retrieved 17 July 2015. ^ "Зведені дані щодо ситуації у зоні АТО – 17 липня" (in Ukrainian). NSDC. 17 July 2015. Retrieved 17 July 2015. ^ "Зведені дані щодо ситуації у зоні АТО – 17 липня" (in Russian). NSDC. 17 July 2015. Retrieved 17 July 2015. ^ "SUMMARY INFORMATION FROM АТО – 17.07.2015 (VIDEO)". NSDC. 17 July 2015. Retrieved 17 July 2015. ^ "Боевики обстреляли пост наблюдателей СЦКК из тяжелого вооружения (фото)". Retrieved 18 July 2015. ^ "Боевики обстреляли позиции сил АТО у населенного пункта Химик". Retrieved 17 July 2015. ^ "Бойовики обстріляли спостережний пост СЦКК". Українська правда. Retrieved 17 July 2015. ^ "На Донбасі бойовики обстріляли село Новгородське, загинув мирний житель". Українська правда. Retrieved 17 July 2015. ^ ""Днепр-1" уничтожил минометную батарею и две казармы боевиков". Retrieved 17 July 2015. ^ "Зведені дані щодо ситуації у зоні АТО – 18 липня" (in Ukrainian). NSDC. 18 July 2015. Retrieved 18 July 2015. ^ "Сводные данные по ситуации в зоне АТО – 18 июля" (in Russian). NSDC. 18 July 2015. Retrieved 18 July 2015. ^ "SUMMARY INFORMATION FROM АТО – 18.07.2015 (VIDEO)". NSDC. 18 July 2015. Retrieved 18 July 2015. ^ "Four People Reported Killed In East Ukraine Fighting". REF/RL. 18 July 2015. Retrieved 18 July 2015. ^ a b Tsvetkova, Maria (19 July 2015). "Intensified shelling in east Ukraine kills four civilians, soldier". Reuters. Retrieved 19 July 2015. ^ "АТО: оккупанты продолжают обстрелы из запрещенного вооружения". Retrieved 20 July 2015. ^ a b "На Луганщине произошел бой сил АТО с диверсантами". Retrieved 20 July 2015. ^ "Russian FM Holds Talks With Ukraine, U.S., German Counterparts". REF/RL. 19 July 2015. Retrieved 19 July 2015. ^ "АТО: оккупанты продолжают обстрелы из запрещенного вооружения". Retrieved 2 August 2015. ^ "Зведені дані щодо ситуації у зоні АТО – 19 липня" (in Ukrainian). NSDC. 19 July 2015. Retrieved 19 July 2015. ^ "Сводные данные по ситуации в зоне АТО – 19 июля" (in Russian). NSDC. 19 July 2015. Retrieved 19 July 2015. ^ "SUMMARY INFORMATION FROM АТО – 19.07.2015 (VIDEO)". NSDC. 19 July 2015. Retrieved 19 July 2015. ^ "Ukraine, rebels trade blame over shelling of central Donetsk". Reuters. 19 July 2015. Retrieved 19 July 2015. ^ "Ukraine crisis: Kiev and rebels trade blame over Donetsk shelling". BBC News Online. 19 July 2015. Retrieved 19 July 2015. ^ "Боевики накрывают огнем из гаубиц и минометов Авдеевку, под обстрел попал коксохим". Retrieved 20 July 2015. ^ "Ситуация в Донбассе стабильно неспокойна - пресс-центр АТО". Retrieved 20 July 2015. ^ "Зведені дані щодо ситуації у зоні АТО – 20 липня" (in Ukrainian). NSDC. 20 July 2015. Retrieved 20 July 2015. ^ "Сводные данные по ситуации в зоне АТО – 20 июля" (in Russian). NSDC. 20 July 2015. Retrieved 20 July 2015. ^ "SUMMARY INFORMATION FROM АТО – 20.07.2015 (VIDEO)". NSDC. 20 July 2015. Retrieved 20 July 2015. ^ "В зоне АТО неспокойно, боевики продолжают обстрелы из артиллерии и танков". Retrieved 20 July 2015. ^ "Террористы сегодня более 40 раз со 120-мм минометов обстреляли позиции сил АТО – пресс-центр". Retrieved 20 July 2015. ^ "В Донецкой области от взрыва гранаты погиб украинский военный". Retrieved 20 July 2015. ^ "Зведені дані щодо ситуації у зоні АТО – 21 липня" (in Ukrainian). NSDC. 21 July 2015. Retrieved 21 July 2015. ^ "Сводные данные по ситуации в зоне АТО – 21 июля" (in Russian). NSDC. 21 July 2015. Retrieved 21 July 2015. ^ "SUMMARY INFORMATION FROM АТО – 21.07.2015 (VIDEO)". NSDC. 21 July 2015. Retrieved 21 July 2015. ^ "Dmitry Tymchuk: Military update 7.20 #FreeSavchenko". Information Resistance. 21 July 2015. Retrieved 21 July 2015. ^ "С самого утра боевики обстреливают позиции сил АТО из артиллерии и стрелкового оружия". Retrieved 21 July 2015. ^ "Террористы полчаса обстреливали из танков жилой район села Зайцево – пресс-центр АТО". Retrieved 21 July 2015. ^ "Зведені дані щодо ситуації у зоні АТО – 22 липня" (in Ukrainian). NSDC. 22 July 2015. Retrieved 22 July 2015. ^ "Сводные данные по ситуации в зоне АТО – 22 июля" (in Russian). NSDC. 22 July 2015. Retrieved 22 July 2015. ^ "SUMMARY INFORMATION FROM АТО – 22.07.2015 (VIDEO)". NSDC. 22 July 2015. Retrieved 22 July 2015. ^ "За прошедшие сутки на Донетчине погиб один мирный житель, ранены девять - ОГА". Retrieved 22 July 2015. ^ "Боевики провоцируют бойцов АТО на ответный огонь, за сутки стреляли около 80 раз - штаб". Retrieved 22 July 2015. ^ "Зведені дані щодо ситуації у зоні АТО – 23 липня" (in Ukrainian). NSDC. 23 July 2015. Retrieved 23 July 2015. ^ "Сводные данные по ситуации в зоне АТО – 23 июля" (in Russian). NSDC. 23 July 2015. Retrieved 23 July 2015. ^ "SUMMARY INFORMATION FROM АТО – 23.07.2015 (VIDEO)". NSDC. 23 July 2015. Retrieved 23 July 2015. ^ "Ukrainian soldier and musician Mykola Hordiichuk killed by booby-trap near Avdiivka. PHOTO". Censor.net. 23 July 2015. Retrieved 23 July 2015. ^ "В АТО погиб украинский певец и музыкант Гордийчук. ФОТО. ВИДЕО" (in Russian). Information Resistance. 23 July 2015. Retrieved 23 July 2015. ^ a b c "Зведені дані щодо ситуації у зоні АТО – 24 липня" (in Ukrainian). NSDC. 24 July 2015. Retrieved 24 July 2015. ^ "Боевики за ночь более полусотни раз обстреляли позиции сил АТО". Retrieved 23 July 2015. ^ a b "Украинские военные попали в засаду боевиков, приняли бой и успешно отразили атаку - штаб". Retrieved 24 July 2015. ^ "Operational data from IR, 07/23: Тerrorist troops continue heavily shelling the ATO forces positions and civilian objects". Information Resistance. 25 July 2015. Retrieved 25 July 2015. ^ "Сводные данные по ситуации в зоне АТО – 24 июля" (in Russian). NSDC. 24 July 2015. Retrieved 24 July 2015. ^ "SUMMARY INFORMATION FROM АТО – 24.07.2015 (VIDEO)". NSDC. 24 July 2015. Retrieved 24 July 2015. ^ "Ситуация в зоне АТО сложная, за сутки боевики более 70 раз обстреляли позиции военных". Retrieved 24 July 2015. ^ "Силы АТО сбили беспилотник террористов "ДНР" (видео)". Retrieved 24 July 2015. ^ "В течение дня зафиксировано около 40 обстрелов позиций сил АТО". Retrieved 24 July 2015. ^ "Зведені дані щодо ситуації у зоні АТО – 25 липня" (in Ukrainian). NSDC. 25 July 2015. Retrieved 25 July 2015. ^ "Сводные данные по ситуации в зоне АТО – 25 июля" (in Russian). NSDC. 25 July 2015. Retrieved 25 July 2015. ^ "SUMMARY INFORMATION FROM АТО – 25.07.2015 (VIDEO)". NSDC. 25 July 2015. Retrieved 25 July 2015. ^ "Ситуация в зоне АТО: более 70 обстрелов за сутки". Retrieved 25 July 2015. ^ "Под Волновахой военные подверглись массированному обстрелу - Бутусов". Retrieved 25 July 2015. ^ "Под Волновахой оккупанты два часа обстреливали позиции сил АТО". Retrieved 25 July 2015. ^ "АТО: 35 обстрелов позиций украинских военных, новые провокации". Retrieved 25 July 2015. ^ "Зведені дані щодо ситуації у зоні АТО – 26 липня" (in Ukrainian). NSDC. 26 July 2015. Retrieved 26 July 2015. ^ "Сводные данные по ситуации в зоне АТО – 26 июля" (in Russian). NSDC. 26 July 2015. Retrieved 26 July 2015. ^ "SUMMARY INFORMATION FROM АТО – 26.07.2015 (VIDEO)". NSDC. 26 July 2015. Retrieved 26 July 2015. ^ "Ukraine Detains Alleged Russian Officer In East". REF/RL. 26 July 2015. Retrieved 26 July 2015. ^ "На блокпосту в зоне АТО боец Нацгвардии наложил на себя руки". Retrieved 26 July 2015. ^ "Боевики начали сегодняшние сутки обстрелами из танков и 122-миллиметровых гаубиц". Retrieved 26 July 2015. ^ "Провокацию боевиков с использованием танков под Счастьем зафиксировала ОБСЕ - пресс-центр АТО". Retrieved 26 July 2015. ^ "Военные сегодня трижды давали отпор нападениям боевиков под Счастьем". Retrieved 26 July 2015. ^ "Зведені дані щодо ситуації у зоні АТО – 27 липня" (in Ukrainian). NSDC. 27 July 2015. Retrieved 27 July 2015. ^ "Сводные данные по ситуации в зоне АТО – 27 июля" (in Russian). NSDC. 27 July 2015. Retrieved 27 July 2015. ^ "SUMMARY INFORMATION FROM АТО – 27.07.2015 (VIDEO)". NSDC. 27 July 2015. Retrieved 27 July 2015. ^ "Обстановка в зоне АТО обострилась, боевики применяют "Грады" – пресс-центр". Retrieved 27 July 2015. ^ "Минобороны ДНР сообщает о 46 нарушениях перемирия со стороны ВСУ за сутки". Novorossia.su. ^ "Зведені дані щодо ситуації у зоні АТО – 28 липня" (in Ukrainian). NSDC. 28 July 2015. Retrieved 28 July 2015. ^ "Сводные данные по ситуации в зоне АТО – 28 июля" (in Russian). NSDC. 28 July 2015. Retrieved 28 July 2015. ^ "SUMMARY INFORMATION FROM АТО – 28.07.2015 (VIDEO)". NSDC. 28 July 2015. Retrieved 28 July 2015. ^ "Spot Report by the OSCE Special Monitoring Mission to Ukraine (SMM): SMM team caught in fire exchange in Shyrokyne, one member injured by debris". Shyrokyne: OSCE. 27 July 2015. Retrieved 28 July 2015. ^ "Боевики за сутки более 80 раз обстреляли силы АТО из танков и "Градов"". Retrieved 28 July 2015. ^ "Российско-террористические войска обстреливают позиции сил АТО из разнокалиберной артиллерии – штаб". Retrieved 29 July 2015. ^ "Большая часть Луганской области осталась без света после обстрела ТЭС в Счастье". Retrieved 6 August 2015. ^ "Зведені дані щодо ситуації у зоні АТО – 29 липня" (in Ukrainian). NSDC. 29 July 2015. Retrieved 29 July 2015. ^ "Сводные данные по ситуации в зоне АТО – 29 июля" (in Russian). NSDC. 29 July 2015. Retrieved 29 July 2015. ^ "SUMMARY INFORMATION FROM АТО – 29.07.2015 (VIDEO)". NSDC. 29 July 2015. Retrieved 29 July 2015. ^ "Около 100 боевиков атаковали позиции сил АТО под Счастьем, бой длился три часа". Retrieved 30 July 2015. ^ "Боевики продолжают обстреливать силы АТО из 152-мм артиллерии вопреки Минским соглашениям". Retrieved 30 July 2015. ^ "В Горловке в результате обстрела убита женщина, ранен ребёнок". Novorossia.su. 30 July 2015. ^ "Боевики ударили из танка по позициям сил АТО возле Гранитного". Retrieved 30 July 2015. ^ "Зведені дані щодо ситуації у зоні АТО – 30 липня" (in Ukrainian). NSDC. 30 July 2015. Retrieved 30 July 2015. ^ "Сводные данные по ситуации в зоне АТО – 30 июля" (in Russian). NSDC. 30 July 2015. Retrieved 30 July 2015. ^ "SUMMARY INFORMATION FROM АТО – 30.07.2015 (VIDEO)". NSDC. 30 July 2015. Retrieved 30 July 2015. ^ "Operational data from IR, 07/29: Russian-terrorist troops in Donbas continue heavily shelling". Information Resistance. 30 July 2015. Retrieved 30 July 2015. ^ "Shelling in eastern Ukraine kills four civilians, soldier". Reuters. 30 July 2015. Retrieved 30 July 2015. ^ "Украинские каратели за сутки более 20 раз нарушили режим прекращения огня". Novorossia.su. 30 July 2015. ^ "Боевики в течение дня продолжали обстреливать военных из запрещенного оружия". Retrieved 30 July 2015. ^ "Зведені дані щодо ситуації у зоні АТО – 31 липня" (in Ukrainian). NSDC. 31 July 2015. Retrieved 31 July 2015. ^ "Сводные данные по ситуации в зоне АТО – 31 июля" (in Russian). NSDC. 31 July 2015. Retrieved 31 July 2015. ^ "SUMMARY INFORMATION FROM АТО – 31.07.2015 (VIDEO)". NSDC. 31 July 2015. Retrieved 31 July 2015. ^ "Боевики из артиллерии обстреляли мирный поселок Острое – пресс-центр АТО". Retrieved 31 July 2015. ^ "Полк "Днепр-1" потерял двух бойцов. ФОТО". Information Resistance. 31 July 2015. Retrieved 31 July 2015. ^ "Ситуация в зоне АТО: 40 обстрелов и бой возле Золотого". Retrieved 31 July 2015. ^ "Зведені дані щодо ситуації у зоні АТО – 01 серпня" (in Ukrainian). NSDC. 1 August 2015. Retrieved 1 August 2015. ^ "Сводные данные по ситуации в зоне АТО – 01 августа" (in Russian). NSDC. 1 August 2015. Retrieved 1 August 2015. ^ "SUMMARY INFORMATION FROM АТО – 01.08.2015 (VIDEO)". NSDC. 1 August 2015. Retrieved 1 August 2015. ^ "Operational data from IR, 07/31:Russian terrorists in Donbas are increasing the intensity of shelling". Information Resistance. 1 August 2015. Retrieved 1 August 2015. ^ "Луганщина за добу: двоє поранених. У Станиці Луганській відносно спокійно". www.loga.gov.ua. loga. 1 August 2015. Retrieved 1 August 2015. ^ "За сутки враг 109 раз нарушил режим тишины - штаб". Retrieved 2 August 2015. ^ "Террористы увеличили количество обстрелов в районе Донецка". Retrieved 3 August 2015. ^ "За сутки боевики открывали огонь более 40 раз - штаб АТО". Retrieved 2 August 2015. ^ "Зведені дані щодо ситуації у зоні АТО – 02 серпня" (in Ukrainian). NSDC. 2 August 2015. Retrieved 2 August 2015. ^ "Сводные данные по ситуации в зоне АТО – 02 августа" (in Russian). NSDC. 2 August 2015. Retrieved 2 August 2015. ^ "SUMMARY INFORMATION FROM АТО – 02.08.2015 (VIDEO)". NSDC. 2 August 2015. Retrieved 2 August 2015. ^ "Боевики сосредоточили огонь на Донецком направлении: за сутки зафиксирован 51 обстрел - штаб". Retrieved 2 August 2015. ^ "За день боевики более полусотни раз обстреляли силы АТО". Retrieved 2 August 2015. ^ "Latest from OSCE Special Monitoring Mission (SMM) to Ukraine based on information received as of 19:30 (Kyiv time), 2 August 2015". OSCE. 3 August 2015. Retrieved 4 August 2015. ^ "Минобороны РФ опровергает слова ОБСЕ о существовании 16-й бригады ВДВ". Korrespondent.net. 4 August 2015. Retrieved 4 August 2015. ^ "Kremlin Downplays OSCE Report Of Russian Troops In Eastern Ukraine". REF/RL. 5 August 2015. Retrieved 5 August 2015. ^ "Latest from OSCE Special Monitoring Mission (SMM) to Ukraine based on information received as of 19:30 (Kyiv time), 3 August 2015". OSCE. 4 August 2015. Retrieved 4 August 2015. ^ "Зведені дані щодо ситуації у зоні АТО – 03 серпня" (in Ukrainian). NSDC. 3 August 2015. Retrieved 3 August 2015. ^ "Сводные данные по ситуации в зоне АТО – 03 августа" (in Russian). NSDC. 3 August 2015. Retrieved 3 August 2015. ^ "SUMMARY INFORMATION FROM АТО – 03.08.2015 (VIDEO)". NSDC. 3 August 2015. Retrieved 3 August 2015. ^ "Four Ukrainian Soldiers Killed Amid Fresh Minsk Peace Talks". REF/RL. 3 August 2015. Retrieved 3 August 2015. ^ "Боевики концентрируют огневую активность в районе Донецка - штаб". Retrieved 3 August 2015. ^ "В течение суток боевики 46 раз нарушили режим тишины, используя артиллерию и минометы". Retrieved 3 August 2015. ^ "Зведені дані щодо ситуації у зоні АТО – 04 серпня" (in Ukrainian). NSDC. 4 August 2015. Retrieved 4 August 2015. ^ "Сводные данные по ситуации в зоне АТО – 04 августа" (in Russian). NSDC. 4 August 2015. Retrieved 4 August 2015. ^ "SUMMARY INFORMATION FROM АТО – 04.08.2015 (VIDEO)". NSDC. 4 August 2015. Retrieved 4 August 2015. ^ "В Донецкой области тракторист подорвался на мине, - МВД". Information Resistance. 4 August 2015. Retrieved 4 August 2015. ^ "В результате обстрела боевиками Станицы Луганской погибли 2 украинских военных". Retrieved 4 August 2015. ^ "Донетчина остается эпицентром огневой активности боевиков - штаб". Retrieved 4 August 2015. ^ "Боевики за день почти 20 раз использовали запрещенное вооружение". Retrieved 5 August 2015. ^ "Зведені дані щодо ситуації у зоні АТО – 05 серпня" (in Ukrainian). NSDC. 5 August 2015. Retrieved 5 August 2015. ^ "Сводные данные по ситуации в зоне АТО – 05 августа" (in Russian). NSDC. 5 August 2015. Retrieved 5 August 2015. ^ "SUMMARY INFORMATION FROM АТО – 05.08.2015 (VIDEO)". NSDC. 5 August 2015. Retrieved 5 August 2015. ^ "Военные отбили две атаки ДРГ боевиков под Донецком". Retrieved 5 August 2015. ^ "АТО: оккупанты продолжают обстрелы на донецком направлении". Retrieved 6 August 2015. ^ "Боевики обстреляли Крымское и Троицкое, ранен боец ВСУ". Retrieved 6 August 2015. ^ "Север Луганской области остался без электроэнергии из-за обстрела города Счастье - ДТЭК". Retrieved 6 August 2015. ^ "Зведені дані щодо ситуації у зоні АТО – 06 серпня" (in Ukrainian). NSDC. 6 August 2015. Retrieved 6 August 2015. ^ "Сводные данные по ситуации в зоне АТО – 06 августа" (in Russian). NSDC. 6 August 2015. Retrieved 6 August 2015. ^ "SUMMARY INFORMATION FROM АТО – 06.08.2015 (VIDEO)". NSDC. 6 August 2015. Retrieved 6 August 2015. ^ "Под обстрелы боевиков снова попали Пески, Авдеевка и Опытное - штаб". Retrieved 7 August 2015. ^ "Dmitry Tymchuk: Military update 8.05 #FreeSavchenko". Information Resistance. 7 August 2015. Retrieved 7 August 2015. ^ "Боевики обстреляли Авдеевку: ранен мирный житель". Retrieved 7 August 2015. ^ a b "Впервые за полмесяца боевики применили реактивную артиллерию". Retrieved 7 August 2015. ^ "Зведені дані щодо ситуації у зоні АТО – 07 серпня" (in Ukrainian). NSDC. 7 August 2015. Retrieved 7 August 2015. ^ "Сводные данные по ситуации в зоне АТО – 07 августа" (in Russian). NSDC. 7 August 2015. Retrieved 7 August 2015. ^ "SUMMARY INFORMATION FROM АТО – 07.08.2015 (VIDEO)". NSDC. 7 August 2015. Retrieved 7 August 2015. ^ a b "В зоне АТО ситуация резко обострилась: боевики за сутки 106 раз обстреляли позиции украинских военных". Retrieved 7 August 2015. ^ "Боевики из танка почти час обстреливали Счастье". Retrieved 8 August 2015. ^ "Зведені дані щодо ситуації у зоні АТО – 08 серпня" (in Ukrainian). NSDC. 8 August 2015. Retrieved 8 August 2015. ^ "Сводные данные по ситуации в зоне АТО – 8 августа" (in Russian). NSDC. 8 August 2015. Retrieved 8 August 2015. ^ "SUMMARY INFORMATION FROM АТО – 08.08.2015 (VIDEO)". NSDC. 8 August 2015. Retrieved 8 August 2015. ^ "За сутки боевики более сотни раз обстреляли позиции сил АТО". Retrieved 8 August 2015. ^ "За день боевики более 60 раз нарушили режим прекращения огня – штаб АТО". Retrieved 8 August 2015. ^ "Боевики из танка почти час обстреливали Счастье". Retrieved 19 August 2015. ^ "Зведені дані щодо ситуації у зоні АТО – 09 серпня" (in Ukrainian). NSDC. 9 August 2015. Retrieved 9 August 2015. ^ "Сводные данные по ситуации в зоне АТО – 09 августа" (in Russian). NSDC. 9 August 2015. Retrieved 9 August 2015. ^ "SUMMARY INFORMATION FROM АТО – 09.08.2015 (VIDEO)". NSDC. 9 August 2015. Retrieved 9 August 2015. ^ Prentice, Alessandra (9 August 2015). "Four OSCE cars torched in separatist east Ukraine". Reuters. Retrieved 9 August 2015. ^ "OSCE Monitoring Mission Vehicles Destroyed In Donetsk". REF/RL. 9 August 2015. Retrieved 9 August 2015. ^ "Эскалация в АТО: позиции украинской армии обстреляли 111 раз". Retrieved 11 August 2015. ^ Tymchuk, Dmitry (10 August 2015). "Operational data from IR, 08/08: Terrorists continue shelling and armed provocations". Information Resistance. Retrieved 12 August 2015. ^ "Террористы активизировались по всей линии фронта - штаб АТО". Retrieved 11 August 2015. ^ "Зведені дані щодо ситуації у зоні АТО – 10 серпня" (in Ukrainian). NSDC. 10 August 2015. Retrieved 10 August 2015. ^ "Сводные данные по ситуации в зоне АТО – 10 августа" (in Russian). NSDC. 10 August 2015. Retrieved 10 August 2015. ^ "SUMMARY INFORMATION FROM АТО – 10.08.2015 (VIDEO)". NSDC. 10 August 2015. Retrieved 10 August 2015. ^ a b "За сутки боевики более сотни раз из "Градов" и минометов обстреляли силы АТО". Retrieved 11 August 2015. ^ "Украинские военные заняли ключевые высоты под Старогнатовкой". Retrieved 10 August 2015. ^ ""Правый сектор": В боях под Старогнатовкой погибли 7 бойцов АТО, 11 ранены (фоторепортаж)". Retrieved 10 August 2015. ^ "Новые подробности боя под Старогнатовкой: мы потеряли танк, а боевики попали под "дружественный" огонь". Retrieved 10 August 2015. ^ "Контрудар армии ДНР остановил попытку наступления ВСУ и боевиков "Правого Сектора"". Novorossia. Retrieved 10 August 2015. ^ "Эдуард Басурин: ВСУ была предпринята попытка захвата населенных пунктов ДНР". Novorossia. 10 August 2015. ^ a b "Боевики из танков обстреливали Марьинку и Опытное". Retrieved 10 August 2015. ^ "ВСУ начали новый обстрел Тельманово, убита женщина". 10 August 2015. ^ "Зведені дані щодо ситуації у зоні АТО – 11 серпня" (in Ukrainian). NSDC. 11 August 2015. Retrieved 11 August 2015. ^ "Сводные данные по ситуации в зоне АТО – 11 августа" (in Russian). NSDC. 11 August 2015. Retrieved 11 August 2015. ^ "SUMMARY INFORMATION FROM АТО – 11.08.2015 (VIDEO)". NSDC. 11 August 2015. Retrieved 11 August 2015. ^ "Как в Волновахе врачи спасают раненых в сегодняшнем бою. ФОТО. СКРИН". Information Resistance. 10 August 2015. Retrieved 10 August 2015. ^ "Боевики ночью не давали покоя военным, обстреляв силы АТО почти сотню раз". Retrieved 11 August 2015. ^ "Боевики усиливают обстрелы населенных пунктов и сил АТО - штаб". Retrieved 11 August 2015. ^ "За время АТО Украина наградила 7 239 своих защитников, из них - 1 415 посмертно, - Минобороны". Information Resistance. 11 August 2015. Retrieved 13 August 2015. ^ "За время АТО на Донбассе погибли 167 бойцов Нацгвардии, более 700 были ранены". Information Resistance. 12 August 2015. Retrieved 13 August 2015. ^ "Зведені дані щодо ситуації у зоні АТО – 12 серпня" (in Ukrainian). NSDC. 12 August 2015. Retrieved 12 August 2015. ^ "Сводные данные по ситуации в зоне АТО – 12 августа" (in Russian). NSDC. 12 August 2015. Retrieved 12 August 2015. ^ "SUMMARY INFORMATION FROM АТО – 12.08.2015 (VIDEO)". NSDC. 12 August 2015. Retrieved 12 August 2015. ^ "Ukraine Reports Intense Battles Near Mariupol". REF/RL. 12 August 2015. Retrieved 12 August 2015. ^ "Зона АТО: день начался с обстрелов Градами близ Донецка". Retrieved 12 August 2015. ^ "В результате обстрела Авдеевки загорелся газопровод". Retrieved 12 August 2015. ^ "Напряжение в зоне АТО не спадает: боевики ведут огонь из градов". Retrieved 12 August 2015. ^ "Зведені дані щодо ситуації у зоні АТО – 13 серпня" (in Ukrainian). NSDC. 13 August 2015. Retrieved 13 August 2015. ^ "Сводные данные по ситуации в зоне АТО – 13 августа" (in Russian). NSDC. 13 August 2015. Retrieved 13 August 2015. ^ "SUMMARY INFORMATION FROM АТО – 13.08.2015 (VIDEO)". NSDC. 13 August 2015. Retrieved 13 August 2015. ^ "Dmitry Tymchuk: Military update 8.12 #FreeSavchenko". Information Resistance. 13 August 2015. Retrieved 15 August 2015. ^ "Прошедшие сутки были самыми "горячими" в зоне АТО за несколько недель, боевики стреляли 152 раза". Retrieved 13 August 2015. ^ "Ситуация в АТО: под огонь боевиков попали Старогнатовка, Авдеевка". Retrieved 13 August 2015. ^ "Зведені дані щодо ситуації у зоні АТО – 14 серпня" (in Ukrainian). NSDC. 14 August 2015. Retrieved 14 August 2015. ^ "Сводные данные по ситуации в зоне АТО – 14 августа" (in Russian). NSDC. 14 August 2015. Retrieved 14 August 2015. ^ "SUMMARY INFORMATION FROM АТО – 14.08.2015 (VIDEO)". NSDC. 14 August 2015. Retrieved 14 August 2015. ^ a b "More Heavy Fighting Reported In Eastern Ukraine". www.rferl.org. REF/RL. 14 August 2015. Retrieved 14 August 2015. ^ "Боевики ночью накрыли огнем из "Градов" позиции военных и города в зоне АТО". Retrieved 19 August 2015. ^ "Боевики продолжают обстреливать позиции сил АТО из "отведенного" вооружения - штаб". Retrieved 20 August 2015. ^ "Зведені дані щодо ситуації у зоні АТО – 15 серпня" (in Ukrainian). NSDC. 15 August 2015. Retrieved 15 August 2015. ^ "Сводные данные по ситуации в зоне АТО – 15 августа" (in Russian). NSDC. 15 August 2015. Retrieved 15 August 2015. ^ "SUMMARY INFORMATION FROM АТО – 15.08.2015 (VIDEO)". NSDC. 15 August 2015. Retrieved 15 August 2015. ^ "Civilians Killed In Eastern Ukraine Following Surge In Shelling". www.rferl.org. REF/RL. 15 August 2015. Retrieved 16 August 2015. ^ "Активность террористов достигла нового максимума - 175 обстрелов". Retrieved 15 August 2015. ^ "Пресс-центр АТО: Больше всего боевики стреляют в районе Донецка". Retrieved 15 August 2015. ^ "Зведені дані щодо ситуації у зоні АТО – 16 серпня" (in Ukrainian). NSDC. 16 August 2015. Retrieved 16 August 2015. ^ "Сводные данные по ситуации в зоне АТО – 16 августа" (in Russian). NSDC. 16 August 2015. Retrieved 16 August 2015. ^ "SUMMARY INFORMATION FROM АТО – 16.08.2015 (VIDEO)". NSDC. 16 August 2015. Retrieved 16 August 2015. ^ "Уменьшив использование реактивной артиллерии, боевики за сутки более 130 раз обстреляли позиции сил АТО - штаб". Retrieved 17 August 2015. ^ a b "Боевики провоцируют силы АТО вдоль всей линии разграничения - штаб". Retrieved 17 August 2015. ^ "Российско-террористические войска четыре раза обстреляли блокпост "Марьинка"". Retrieved 17 August 2015. ^ "Боевики обстреливают Сартану и Лебединское под Мариуполем, есть пострадавшие". Retrieved 17 August 2015. ^ "Зведені дані щодо ситуації у зоні АТО – 17 серпня" (in Ukrainian). NSDC. 17 August 2015. Retrieved 17 August 2015. ^ "Сводные данные по ситуации в зоне АТО – 17 августа" (in Russian). NSDC. 17 August 2015. Retrieved 17 August 2015. ^ "SUMMARY INFORMATION FROM АТО – 17.08.2015 (VIDEO)". NSDC. 17 August 2015. Retrieved 17 August 2015. ^ "Intense Artillery Duel Rocks Ukraine's Coastal City Of Mariupol". www.rferl.org. REF/RL. 17 August 2015. Retrieved 17 August 2015. ^ a b "Civilians killed as fighting flares in eastern Ukraine / Civilians, soldiers die in east Ukraine fighting as Putin visits Crimea". Reuters. 17 August 2015. Retrieved 17 August 2015. ^ "7 civilians, 2 troops dead in eastern Ukraine as shelling increases between govt, rebels". U.S. News & World Report. 17 August 2015. Retrieved 17 August 2015. ^ "Latest from OSCE Special Monitoring Mission (SMM) to Ukraine based on information received as of 19:30 (Kyiv time), 17 August 2015". OSCE. 18 August 2015. Retrieved 19 August 2015. ^ "Боевики из "Градов" обстреляли ряд позиций сил АТО". Retrieved 17 August 2015. ^ "В штабе АТО заявили о снижении активности боевиков в течение дня". Retrieved 19 August 2015. ^ "Зведені дані щодо ситуації у зоні АТО – 18 серпня" (in Ukrainian). NSDC. 18 August 2015. Retrieved 18 August 2015. ^ "Сводные данные по ситуации в зоне АТО – 18 августа" (in Russian). NSDC. 18 August 2015. Retrieved 18 August 2015. ^ "SUMMARY INFORMATION FROM АТО – 18.08.2015 (VIDEO)". NSDC. 18 August 2015. Retrieved 18 August 2015. ^ "Боевики из артиллерии и минометов обстреляли несколько опорных пунктов сил АТО". Retrieved 18 August 2015. ^ "Оккупанты обстреляли Широкино из 120-мм минометов и гранатометов". Retrieved 19 August 2015. ^ "Зведені дані щодо ситуації у зоні АТО – 19 серпня" (in Ukrainian). NSDC. 19 August 2015. Retrieved 19 August 2015. ^ "Сводные данные по ситуации в зоне АТО – 19 августа" (in Russian). NSDC. 19 August 2015. Retrieved 19 August 2015. ^ "SUMMARY INFORMATION FROM АТО – 19.08.2015 (VIDEO)". NSDC. 19 August 2015. Retrieved 19 August 2015. ^ "На Луганщине погибли двое военных, подорвавшись на растяжке". Retrieved 20 August 2015. ^ "Боевики обстреляли мирных жителей Марьинки и Павлополя". Retrieved 20 August 2015. ^ "Зведені дані щодо ситуації у зоні АТО – 20 серпня" (in Ukrainian). NSDC. 20 August 2015. Retrieved 20 August 2015. ^ "Сводные данные по ситуации в зоне АТО – 20 августа" (in Russian). NSDC. 20 August 2015. Retrieved 20 August 2015. ^ "SUMMARY INFORMATION FROM АТО – 20.08.2015 (VIDEO)". NSDC. 20 August 2015. Retrieved 20 August 2015. ^ "Ukraine leader looks to summit with Germany, France, to curb Russian 'aggression'". Reuters. 20 August 2015. Retrieved 20 August 2015. ^ a b "Four Ukrainian Soldiers Killed In Fighting; Others Released". REF/RL. 20 August 2015. Retrieved 21 August 2015. ^ "АТО: боевики обстреляли Лебединское, пригороды Донецка и Авдеевку". Retrieved 21 August 2015. ^ "Зведені дані щодо ситуації у зоні АТО – 21 серпня" (in Ukrainian). NSDC. 21 August 2015. Retrieved 21 August 2015. ^ "Сводные данные по ситуации в зоне АТО – 21 августа" (in Russian). NSDC. 21 August 2015. Retrieved 21 August 2015. ^ "SUMMARY INFORMATION FROM АТО – 21.08.2015 (VIDEO)". NSDC. 21 August 2015. Retrieved 21 August 2015. ^ a b "За прошедшие сутки в зоне АТО ранены двое военных". UNIAN. 21 August 2015. Retrieved 21 August 2015. ^ a b "Карта боев в Донбассе: ситуация на 21 августа". Liga News. 21 August 2015. Retrieved 21 August 2015. ^ "У штабі констатують загострення ситуації на Донбасі, військові відбили атаку на Артемівському напрямку". Retrieved 23 August 2015. ^ "Зведені дані щодо ситуації у зоні АТО – 22 серпня" (in Ukrainian). NSDC. 22 August 2015. Retrieved 22 August 2015. ^ "Сводные данные по ситуации в зоне АТО – 22 августа" (in Russian). NSDC. 22 August 2015. Retrieved 22 August 2015. ^ "SUMMARY INFORMATION FROM АТО – 22.08.2015 (VIDEO)". NSDC. 22 August 2015. Retrieved 22 August 2015. ^ a b "Ukraine Says Donbas Situation Worsening". REF/RL. 22 August 2015. Retrieved 22 August 2015. ^ "Боевики обстреливают силы АТО почти вдоль всей линии разграничения, горячее всего - в районе Артемовска". Retrieved 23 August 2015. ^ ukraineunderattack.org. "Militants Continue Active Attacks With Mortars And Heavy Artillery In Mariupol Direction". Ukraine Under Attack. Retrieved 23 August 2015. ^ "Боевики продолжают провокации, обстреливая силы АТО из запрещенного Минскими соглашениями оружия". Retrieved 23 August 2015. ^ Zinets, Natalia (22 August 2015). "Military pressure on Ukraine will last decades, president says". Reuters. Retrieved 22 August 2015. ^ "Зведені дані щодо ситуації у зоні АТО – 23 серпня" (in Ukrainian). NSDC. 23 August 2015. Retrieved 23 August 2015. ^ "Сводные данные по ситуации в зоне АТО – 23 августа" (in Russian). NSDC. 23 August 2015. Retrieved 23 August 2015. ^ "SUMMARY INFORMATION FROM АТО – 23.08.2015 (VIDEO)". NSDC. 23 August 2015. Retrieved 23 August 2015. ^ Zinets, Natalia; Balmforth, Richard (23 August 2015). "Ukraine leader urges unity to bring change, combat Russian 'aggressor'". Reuters. Retrieved 23 August 2015. ^ "Оперативная сводка штаба АТО на 06:00 – 23 августа" (in Russian). NSDC. 23 August 2015. Retrieved 23 August 2015. ^ "За сутки боевики нарушили режим прекращения огня 78 раз - штаб". Retrieved 24 August 2015. ^ "Ситуация в АТО: боевики ведут обстрелы ночью и покидают позиции". Retrieved 24 August 2015. ^ "Зведені дані щодо ситуації у зоні АТО – 24 серпня" (in Ukrainian). NSDC. 24 August 2015. Retrieved 24 August 2015. ^ "Сводные данные по ситуации в зоне АТО – 24 августа" (in Russian). NSDC. 24 August 2015. Retrieved 24 August 2015. ^ "SUMMARY INFORMATION FROM АТО – 24.08.2015 (VIDEO)". NSDC. 24 August 2015. Retrieved 24 August 2015. ^ "Оперативная сводка штаба АТО на 06:00 – 24 августа" (in Russian). NSDC. 24 August 2015. Retrieved 24 August 2015. ^ "Ситуация в зоне АТО обострилась: за сутки 18 артиллерийских обстрелов, 40 минометных". Retrieved 24 August 2015. ^ "АТО: оккупанты вновь ударили по Широкино, Марьинке и Опытному". Retrieved 25 August 2015. ^ "Ukraine faces risky year fighting to escape Russian orbit: Poroshenko". Reuters. 24 August 2015. Retrieved 24 August 2015. ^ "Ukraine's Poroshenko: 'New Russia' is like 'Mordor'". BBC News Online. 24 August 2015. Retrieved 24 August 2015. ^ "Зведені дані щодо ситуації у зоні АТО – 25 серпня" (in Ukrainian). NSDC. 25 August 2015. Retrieved 25 August 2015. ^ "Сводные данные по ситуации в зоне АТО – 25 августа" (in Russian). NSDC. 25 August 2015. Retrieved 25 August 2015. ^ "SUMMARY INFORMATION FROM ATO – 25.08.2015 (VIDEO)". NSDC. 25 August 2015. Retrieved 25 August 2015. ^ "Оперативная сводка штаба АТО на 06:00 – 25 августа" (in Russian). NSDC. 25 August 2015. Retrieved 25 August 2015. ^ "День Независимости в зоне АТО прошел под звуки стрельбы из танков и минометов". Retrieved 26 August 2015. ^ "Вооруженные провокации боевиков зафиксированы по всей линии разграничения". Retrieved 25 August 2015. ^ "ВСУ атаковали армию ДНР под Белой Каменкой: бой идет несколько часов". Novorossia.su. 25 August 2015. ^ "Зведені дані щодо ситуації у зоні АТО – 26 серпня" (in Ukrainian). NSDC. 26 August 2015. Retrieved 26 August 2015. ^ "Сводные данные по ситуации в зоне АТО – 26 августа" (in Russian). NSDC. 26 August 2015. Retrieved 26 August 2015. ^ "SUMMARY INFORMATION FROM ATO – 26.08.2015 (VIDEO)". NSDC. 26 August 2015. Retrieved 26 August 2015. ^ a b "Ukraine, separatists to strive for full ceasefire from September 1". Reuters. 26 August 2015. Retrieved 26 August 2015. ^ "Оперативная сводка штаба АТО на 06:00 – 26 августа" (in Russian). NSDC. 26 August 2015. Retrieved 26 August 2015. ^ "После затишья боевики снова начали накрывать огнем из артиллерии силы АТО". Retrieved 26 August 2015. ^ "Боевики возобновили обстрелы Станицы Луганской: Перебиты газопровод и линии электропередач". Retrieved 26 August 2015. ^ "Боевики применили тактику "выжженной земли" в районе Красногоровки". Retrieved 26 August 2015. ^ "Зведені дані щодо ситуації у зоні АТО – 27 серпня" (in Ukrainian). NSDC. 27 August 2015. Retrieved 27 August 2015. ^ "Сводные данные по ситуации в зоне АТО – 27 августа" (in Russian). NSDC. 27 August 2015. Retrieved 27 August 2015. ^ "SUMMARY INFORMATION FROM ATO – 27.08.2015 (VIDEO)". NSDC. 27 August 2015. Retrieved 27 August 2015. ^ a b "Seven Ukraine servicemen killed, 13 wounded: Ukraine military". Reuters. 27 August 2015. Retrieved 27 August 2015. ^ "Dmitry Tymchuk: Military update 8.26 #FreeSavchenko". Information Resistance. 27 August 2015. Retrieved 29 August 2015. ^ "Стали известны потери боевиков в секторе "М": 51 раненый и уничтоженные склады боеприпасов". Retrieved 1 September 2015. ^ "Оперативная сводка штаба АТО на 06:00 – 27 августа" (in Russian). NSDC. 27 August 2015. Retrieved 27 August 2015. ^ "Украинские каратели обстреливают из танков поселок Раевка (ЛНР)". Novorossia.su. 27 August 2015. ^ "Зведені дані щодо ситуації у зоні АТО – 28 серпня" (in Ukrainian). NSDC. 28 August 2015. Retrieved 28 August 2015. ^ "Сводные данные по ситуации в зоне АТО – 28 августа" (in Russian). NSDC. 28 August 2015. Retrieved 28 August 2015. ^ "SUMMARY INFORMATION FROM ATO – 28.08.2015 (VIDEO)". NSDC. 28 August 2015. Retrieved 28 August 2015. ^ "Оперативная сводка штаба АТО на 06:00 – 28 августа" (in Russian). NSDC. 28 August 2015. Retrieved 28 August 2015. ^ "За ночь боевики более 100 раз открывали огонь из "Градов" и минометов". Retrieved 1 September 2015. ^ "Боевики продолжают обстреливать Луганскую область из тяжелой артиллерии, ранен военный и мирный житель". Retrieved 1 September 2015. ^ "Зведені дані щодо ситуації у зоні АТО – 29 серпня" (in Ukrainian). NSDC. 29 August 2015. Retrieved 29 August 2015. ^ "Сводные данные по ситуации в зоне АТО – 29 августа" (in Russian). NSDC. 29 August 2015. Retrieved 29 August 2015. ^ "SUMMARY INFORMATION FROM ATO – 29.08.2015 (VIDEO)". NSDC. 29 August 2015. Retrieved 29 August 2015. ^ "Оперативная сводка штаба АТО на 06:00 – 29 августа" (in Russian). NSDC. 29 August 2015. Retrieved 29 August 2015. ^ "Накануне выходных боевики уменьшили количество обстрелов сил АТО". Retrieved 29 August 2015. ^ "В Луганской области двое военных подорвались на растяжке". Retrieved 29 August 2015. ^ "Боевики в течение суток осуществляли одиночные провокации - штаб". Retrieved 29 August 2015. ^ "Зведені дані щодо ситуації у зоні АТО – 30 серпня" (in Ukrainian). NSDC. 30 August 2015. Retrieved 30 August 2015. ^ "Сводные данные по ситуации в зоне АТО – 30 августа" (in Russian). NSDC. 30 August 2015. Retrieved 30 August 2015. ^ "SUMMARY INFORMATION FROM ATO – 30.08.2015 (VIDEO)". NSDC. 30 August 2015. Retrieved 30 August 2015. ^ "Оперативная сводка штаба АТО на 06:00 – 30 августа" (in Russian). NSDC. 30 August 2015. Retrieved 30 August 2015. ^ "Четыре мины упали на территорию Донецкого завода химизделий". Novorossia.su. 30 August 2015. ^ a b "Ситуация в зоне АТО остается стабильной, боевики ночью не использовали запрещенное оружие - штаб". Retrieved 30 August 2015. ^ a b c "В зоне АТО зафиксировано самое низкое количество обстрелов за последние 4 месяца". Retrieved 30 August 2015. ^ "Сегодня в зоне АТО боевики практически соблюдали режим прекращения огня - штаб". Retrieved 31 August 2015. ^ "Зведені дані щодо ситуації у зоні АТО – 31 серпня" (in Ukrainian). NSDC. 31 August 2015. Retrieved 31 August 2015. ^ "Сводные данные по ситуации в зоне АТО – 31 августа" (in Russian). NSDC. 31 August 2015. Retrieved 31 August 2015. ^ "SUMMARY INFORMATION FROM ATO – 31.08.2015 (VIDEO)". NSDC. 31 August 2015. Retrieved 31 August 2015. ^ "Оперативная сводка штаба АТО на 06:00 – 31 августа" (in Russian). NSDC. 31 August 2015. Retrieved 31 August 2015. ^ "В течение дня в зоне АТО произошла лишь одна вооруженная провокация боевиков – штаб". Retrieved 1 September 2015. ^ "ОБСЕ сообщила о потере на Донбассе беспилотника, который зафиксировал тяжелое вооружение боевиков". Retrieved 1 September 2015. ^ "Зведені дані щодо ситуації у зоні АТО – 01 вересня" (in Ukrainian). NSDC. 1 September 2015. Retrieved 1 September 2015. ^ "Сводные данные по ситуации в зоне АТО – 01 cентября" (in Russian). NSDC. 1 September 2015. Retrieved 1 September 2015. ^ "SUMMARY INFORMATION FROM ATO – 01.09.2015 (VIDEO)". NSDC. 1 September 2015. Retrieved 1 September 2015. ^ "Оперативная сводка штаба АТО на 06:00 – 01 cентября" (in Russian). NSDC. 1 September 2015. Retrieved 1 September 2015. ^ "Басурин: Командование ВСУ продолжает концентрировать войска на линии фронта". Novorossia.su. 1 September 2015. ^ "Боевики из стрелкового оружия несколько раз обстреляли позиции сил АТО". Retrieved 1 September 2015. ^ "Зведені дані щодо ситуації у зоні АТО – 02 вересня" (in Ukrainian). NSDC. 2 September 2015. Retrieved 2 September 2015. ^ a b "Сводные данные по ситуации в зоне АТО – 02 cентября" (in Russian). NSDC. 2 September 2015. Retrieved 2 September 2015. ^ "SUMMARY INFORMATION FROM АТО – 02.09.2015 (VIDEO)". NSDC. 2 September 2015. Retrieved 2 September 2015. ^ "Оперативная сводка штаба АТО на 06:00 – 02 cентября" (in Russian). NSDC. 2 September 2015. Retrieved 2 September 2015. ^ "В районе Счастья расстреляли сводную мобильную группу: есть погибшие и раненые". Information Resistance. 2 September 2015. Retrieved 2 September 2015. ^ "Стали известны подробности расстрела мобильной группы ВСУ". Korrespondent.net. 2 September 2015. Retrieved 2 September 2015. ^ "Ukraine conflict: Deadly Luhansk ambush ends lull in east". BBC News Online. 2 September 2015. Retrieved 2 September 2015. ^ "Ситуация на Луганском направлении обострилась, боевики пытаются втянуть силы АТО в противостояние - штаб". Retrieved 2 September 2015. ^ "Зведені дані щодо ситуації у зоні АТО – 03 вересня" (in Ukrainian). NSDC. 3 September 2015. Retrieved 3 September 2015. ^ "Сводные данные по ситуации в зоне АТО – 03 cентября" (in Russian). NSDC. 3 September 2015. Retrieved 3 September 2015. ^ "SUMMARY INFORMATION FROM ATO – 03.09.2015 (VIDEO)". NSDC. 3 September 2015. Retrieved 3 September 2015. ^ "Оперативная сводка штаба АТО на 06:00 – 03 cентября" (in Russian). NSDC. 3 September 2015. Retrieved 3 September 2015. ^ a b "Боевики прекратили системный огонь по позициям сил АТО". Retrieved 3 September 2015. ^ "ОБСЕ подтверждает нарушение перемирия на донецком направлении". Retrieved 3 September 2015. ^ "Контрабанда в АТО: на месте атаки на сводную группу погиб офицер". Retrieved 3 September 2015. ^ "В течение дня боевики только один раз применили оружие на Донбассе - штаб". Retrieved 3 September 2015. ^ "Зведені дані щодо ситуації у зоні АТО – 04 вересня" (in Ukrainian). NSDC. 4 September 2015. Retrieved 4 September 2015. ^ "Сводные данные по ситуации в зоне АТО – 04 cентября" (in Russian). NSDC. 4 September 2015. Retrieved 4 September 2015. ^ "SUMMARY INFORMATION FROM ATO – 04.09.2015 (VIDEO)". NSDC. 4 September 2015. Retrieved 4 September 2015. ^ a b "Оперативная сводка штаба АТО на 06:00 – 04 cентября" (in Russian). NSDC. 4 September 2015. Retrieved 4 September 2015. ^ "Ситуация в АТО: произошли бои в районе донецкого аэропорта". Retrieved 4 October 2015. ^ "Ситуация в зоне АТО: оккупанты шесть раз обстреливали ВСУ". Retrieved 4 September 2015. ^ "Зведені дані щодо ситуації у зоні АТО – 05 вересня" (in Ukrainian). NSDC. 5 September 2015. Retrieved 5 September 2015. ^ "Сводные данные по ситуации в зоне АТО – 05 cентября" (in Russian). NSDC. 5 September 2015. Retrieved 5 September 2015. ^ "SUMMARY INFORMATION FROM ATO – 05.09.2015 (VIDEO)". NSDC. 5 September 2015. Retrieved 5 September 2015. ^ "Ukraine's President Says Cease-Fire Observed For Week". REF/RL. 5 September 2015. Retrieved 5 September 2015. ^ "Оперативная сводка штаба АТО на 06:00 – 05 cентября" (in Russian). NSDC. 5 September 2015. Retrieved 5 September 2015. ^ "Зведені дані щодо ситуації у зоні АТО – 06 вересня" (in Ukrainian). NSDC. 6 September 2015. Retrieved 6 September 2015. ^ "Сводные данные по ситуации в зоне АТО – 06 cентября" (in Russian). NSDC. 6 September 2015. Retrieved 6 September 2015. ^ "SUMMARY INFORMATION FROM ATO – 06.09.2015 (VIDEO)". NSDC. 6 September 2015. Retrieved 6 September 2015. ^ "Оперативная сводка штаба АТО на 06:00 – 06 cентября" (in Russian). NSDC. 6 September 2015. Retrieved 6 September 2015. ^ a b "Боевики совершают хаотичные обстрелы из гранатометов в зоне АТО, несмотря на объявленное перемирие". Retrieved 8 September 2015. ^ "Ситуация в зоне АТО сегодня оставалась относительно спокойной – штаб". Retrieved 8 September 2015. ^ "Зведені дані щодо ситуації у зоні АТО – 07 вересня" (in Ukrainian). NSDC. 7 September 2015. Retrieved 7 September 2015. ^ "Сводные данные по ситуации в зоне АТО – 07 cентября" (in Russian). NSDC. 7 September 2015. Retrieved 7 September 2015. ^ "SUMMARY INFORMATION FROM АТО – 07.09.2015 (VIDEO)". NSDC. 7 September 2015. Retrieved 7 September 2015. ^ "Под Волновахой боец АТО застрелил двоих сослуживцев и скрылся с оружием - журналист". Retrieved 7 September 2015. ^ "На Донетчине задержали бойца АТО, расстрелявшего из-за конфликта двух разведчиков". Retrieved 7 September 2015. ^ "Оперативная сводка штаба АТО на 06:00 – 07 cентября" (in Russian). NSDC. 7 September 2015. Retrieved 7 September 2015. ^ "За сутки боевики 12 раз обстреляли позиции сил АТО, утром огневая активность прекратилась - штаб". Retrieved 7 September 2015. ^ "В Станице Луганской нашли тела пяти диверсантов". Retrieved 7 September 2015. ^ "Сегодня с полуночи в зоне АТО не было ни одного случая применения оружия – штаб". Retrieved 7 September 2015. ^ "Зведені дані щодо ситуації у зоні АТО – 08 вересня" (in Ukrainian). NSDC. 8 September 2015. Retrieved 8 September 2015. ^ "Сводные данные по ситуации в зоне АТО – 08 cентября" (in Russian). NSDC. 8 September 2015. Retrieved 8 September 2015. ^ "SUMMARY INFORMATION FROM ATO – 08.09.2015 (VIDEO)". NSDC. 8 September 2015. Retrieved 8 September 2015. ^ "На Луганщине во время боевого столкновения с террористами погибли двое украинских военных". Retrieved 8 September 2015. ^ "Оперативная сводка штаба АТО на 06:00 – 08 cентября" (in Russian). NSDC. 8 September 2015. Retrieved 8 September 2015. ^ "Ukraine fighting at lowest level since conflict broke out". BBC News Online. 8 September 2015. Retrieved 8 September 2015. ^ "За сутки боевики всего один раз нарушили перемирие - штаб АТО". Retrieved 8 September 2015. ^ "Ukraine conflict death toll nears 8,000: UN". Deutsche Welle. 8 September 2015. Retrieved 8 September 2015. ^ "Зведені дані щодо ситуації у зоні АТО – 09 вересня" (in Ukrainian). NSDC. 9 September 2015. Retrieved 9 September 2015. ^ "Сводные данные по ситуации в зоне АТО – 09 cентября" (in Russian). NSDC. 9 September 2015. Retrieved 9 September 2015. ^ "SUMMARY INFORMATION FROM ATO – 09.09.2015 (VIDEO)". NSDC. 9 September 2015. Retrieved 9 September 2015. ^ "На Луганщине ДРГ боевиков пыталась прорвать оборону: погиб боец ВСУ". Information Resistance. 9 September 2015. Retrieved 9 September 2015. ^ "Оперативная сводка штаба АТО на 06:00 – 09 cентября" (in Russian). NSDC. 9 September 2015. Retrieved 9 September 2015. ^ "Боевики за сутки четыре раза нарушили перемирие, под утро обстрелы прекратились - штаб". Retrieved 10 September 2015. ^ "Боевики из минометов обстреляли пограничный наряд на "Кугуаре"". Retrieved 10 September 2015. ^ "Боевики в течение дня дважды из гранатомета и стрелкового оружия обстреляли позиции сил АТО – штаб". Retrieved 10 September 2015. ^ "Зведені дані щодо ситуації у зоні АТО – 10 вересня" (in Ukrainian). NSDC. 10 September 2015. Retrieved 10 September 2015. ^ "Сводные данные по ситуации в зоне АТО – 10 cентября" (in Russian). NSDC. 10 September 2015. Retrieved 10 September 2015. ^ "SUMMARY INFORMATION FROM ATO – 10.09.2015 (VIDEO)". NSDC. 10 September 2015. Retrieved 10 September 2015. ^ "Оперативная сводка штаба АТО на 06:00 – 10 cентября" (in Russian). NSDC. 10 September 2015. Retrieved 10 September 2015. ^ "В Троицком на растяжке террористов подорвались шестеро военных, один боец погиб". Retrieved 10 September 2015. ^ "Умер второй боец из группы, которая подорвалась на растяжке в Луганской области". Retrieved 10 September 2015. ^ "В течение сегодняшнего дня в зоне АТО не прозвучало ни одного выстрела - штаб". Retrieved 10 September 2015. ^ "Зведені дані щодо ситуації у зоні АТО – 11 вересня" (in Ukrainian). NSDC. 11 September 2015. Retrieved 11 September 2015. ^ "Сводные данные по ситуации в зоне АТО – 11 cентября" (in Russian). NSDC. 11 September 2015. Retrieved 11 September 2015. ^ "SUMMARY INFORMATION FROM АТО – 11.09.2015 (VIDEO)". NSDC. 11 September 2015. Retrieved 11 September 2015. ^ "Оперативная сводка штаба АТО на 06:00 – 11 cентября" (in Russian). NSDC. 11 September 2015. Retrieved 11 September 2015. ^ "Сегодня боевики дважды нарушили перемирие на Донбассе, ранен военный". Retrieved 11 September 2015. ^ "Боевики ранили одного военнослужащего неподалеку от Донецкого аэропорта - штаб". Retrieved 12 September 2015. ^ "Зведені дані щодо ситуації у зоні АТО – 12 вересня" (in Ukrainian). NSDC. 12 September 2015. Retrieved 12 September 2015. ^ "Сводные данные по ситуации в зоне АТО – 12 cентября" (in Russian). NSDC. 12 September 2015. Retrieved 12 September 2015. ^ "SUMMARY INFORMATION FROM ATO – 12.09.2015 (VIDEO)". NSDC. 12 September 2015. Retrieved 12 September 2015. ^ "Оперативная сводка штаба АТО на 06:00 – 12 cентября" (in Russian). NSDC. 12 September 2015. Retrieved 12 September 2015. ^ "Боевики 5 раз нарушили режим тишины: обстреляли Авдеевку и Опытное". Retrieved 14 September 2015. ^ "Сегодня в зоне АТО боевики только один раз нарушили перемирие - штаб". Retrieved 14 September 2015. ^ "Зведені дані щодо ситуації у зоні АТО – 13 вересня" (in Ukrainian). NSDC. 13 September 2015. Retrieved 13 September 2015. ^ "Сводные данные по ситуации в зоне АТО – 13 cентября" (in Russian). NSDC. 13 September 2015. Retrieved 13 September 2015. ^ "SUMMARY INFORMATION FROM ATO – 13.09.2015 (VIDEO)". NSDC. 13 September 2015. Retrieved 13 September 2015. ^ "Оперативная сводка штаба АТО на 06:00 – 13 cентября" (in Russian). NSDC. 13 September 2015. Retrieved 13 September 2015. ^ "Боевики трижды провоцировали силы АТО за ночь, утром на Донбассе сохраняется тишина - штаб". Retrieved 13 September 2015. ^ a b "Боевики на Донбассе за неделю расстреляли троих мирных жителей". Retrieved 13 September 2015. ^ "Зведені дані щодо ситуації у зоні АТО – 14 вересня" (in Ukrainian). NSDC. 14 September 2015. Retrieved 14 September 2015. ^ "Сводные данные по ситуации в зоне АТО – 14 cентября" (in Russian). NSDC. 14 September 2015. Retrieved 14 September 2015. ^ "SUMMARY INFORMATION FROM ATO – 14.09.2015 (VIDEO)". NSDC. 14 September 2015. Retrieved 14 September 2015. ^ "За сутки в зоне АТО погибли двое военных, еще один пропал без вести". Retrieved 14 September 2015. ^ "Оперативная сводка штаба АТО на 06:00 – 14 cентября" (in Russian). NSDC. 14 September 2015. Retrieved 14 September 2015. ^ "Ситуация в зоне АТО несколько обострилась: боевики вновь применяют крупнокалиберное оружие". Retrieved 14 September 2015. ^ "Боевики сосредоточили огневую активность на Артемовском направлении - штаб". Retrieved 14 September 2015. ^ "Зведені дані щодо ситуації у зоні АТО – 15 вересня" (in Ukrainian). NSDC. 15 September 2015. Retrieved 15 September 2015. ^ "Сводные данные по ситуации в зоне АТО – 15 cентября" (in Russian). NSDC. 15 September 2015. Retrieved 15 September 2015. ^ "SUMMARY INFORMATION FROM ATO – 15.09.2015 (VIDEO)". NSDC. 15 September 2015. Retrieved 15 September 2015. ^ "Оперативная сводка штаба АТО на 06:00 – 15 cентября" (in Russian). NSDC. 15 September 2015. Retrieved 15 September 2015. ^ "Вражеские силы из крупнокалиберного оружия обстреляли опорный пункт военных в Майорске". Retrieved 15 September 2015. ^ "Боевики усилили огневую активность, сосредоточив ее на нескольких направлениях - штаб". Retrieved 15 September 2015. ^ "Зведені дані щодо ситуації у зоні АТО – 16 вересня" (in Ukrainian). NSDC. 16 September 2015. Retrieved 16 September 2015. ^ "Сводные данные по ситуации в зоне АТО – 16 cентября" (in Russian). NSDC. 16 September 2015. Retrieved 16 September 2015. ^ "SUMMARY INFORMATION FROM ATO – 16.09.2015 (VIDEO)". NSDC. 16 September 2015. Retrieved 16 September 2015. ^ "Оперативная сводка штаба АТО на 06:00 – 16 cентября" (in Russian). NSDC. 16 September 2015. Retrieved 16 September 2015. ^ a b "Ситуация в АТО: стреляют снайперы боевиков, ранены двое военных". Retrieved 17 September 2015. ^ "На Луганщине подорвался боец АТО, в целом в области сохраняется "режим тишины" - Тука". Retrieved 17 September 2015. ^ "Боевики провели массированный обстрел блокпоста Марьинка". Retrieved 17 September 2015. ^ "Сегодня в зоне АТО не зафиксировано случаев применения оружия". Retrieved 17 September 2015. ^ "Зведені дані щодо ситуації у зоні АТО – 17 вересня" (in Ukrainian). NSDC. 17 September 2015. Retrieved 17 September 2015. ^ "Сводные данные по ситуации в зоне АТО – 17 cентября" (in Russian). NSDC. 17 September 2015. Retrieved 17 September 2015. ^ "SUMMARY INFORMATION FROM ATO – 17.09.2015 (VIDEO)". NSDC. 17 September 2015. Retrieved 17 September 2015. ^ "Оперативная сводка штаба АТО на 06:00 – 17 cентября" (in Russian). NSDC. 17 September 2015. Retrieved 17 September 2015. ^ "Террористы обстреляли из гранатомета машину ВСУ: двое бойцов были ранены". Information Resistance. 18 September 2015. Retrieved 18 September 2015. ^ "У селі Валуйському з гранатомету було поранено двох військовослужбовців 128-ї бригади". State Administration of Luhansk Oblast. 18 September 2015. Retrieved 18 September 2015. ^ "Клоуны "ДНР": сами заминировали, сами и подорвались, - ИС". Information Resistance. 18 September 2015. Retrieved 18 September 2015. ^ "Боевики нанесли артудар по окрестностям Красногоровки - МВД". Retrieved 19 September 2015. ^ "Зведені дані щодо ситуації у зоні АТО – 18 вересня" (in Ukrainian). NSDC. 18 September 2015. Retrieved 18 September 2015. ^ "Сводные данные по ситуации в зоне АТО – 18 cентября" (in Russian). NSDC. 18 September 2015. Retrieved 18 September 2015. ^ "SUMMARY INFORMATION FROM ATO – 18.09.2015 (VIDEO)". NSDC. 18 September 2015. Retrieved 18 September 2015. ^ "За сутки в зоне АТО погибли двое военных, пятеро получили ранения". Retrieved 18 September 2015. ^ "Оперативная сводка штаба АТО на 06:00 – 18 cентября" (in Russian). NSDC. 18 September 2015. Retrieved 18 September 2015. ^ "Минувшие сутки в зоне АТО прошли спокойно: боевики применили оружие только раз". Retrieved 19 September 2015. ^ "Боевики не обстреливали силы АТО, однако снова прибегли к провокациям - штаб". Retrieved 19 September 2015. ^ "Зведені дані щодо ситуації у зоні АТО – 19 вересня" (in Ukrainian). NSDC. 19 September 2015. Retrieved 19 September 2015. ^ "Сводные данные по ситуации в зоне АТО – 19 cентября" (in Russian). NSDC. 19 September 2015. Retrieved 19 September 2015. ^ "SUMMARY INFORMATION FROM ATO – 19.09.2015 (VIDEO)". NSDC. 19 September 2015. Retrieved 19 September 2015. ^ "На Луганщине один воин погиб, один – ранен" (in Russian). Information Resistance. 19 September 2015. Retrieved 19 September 2015. ^ "Оперативная сводка штаба АТО на 06:00 – 19 cентября" (in Russian). NSDC. 19 September 2015. Retrieved 19 September 2015. ^ "День в зоне АТО прошел без единого выстрела - пресс-центр". Retrieved 19 September 2015. ^ "Зведені дані щодо ситуації у зоні АТО – 20 вересня" (in Ukrainian). NSDC. 20 September 2015. Retrieved 20 September 2015. ^ a b "Сводные данные по ситуации в зоне АТО – 20 cентября" (in Russian). NSDC. 20 September 2015. Retrieved 20 September 2015. ^ "SUMMARY INFORMATION FROM ATO – 20.09.2015 (VIDEO)". NSDC. 20 September 2015. Retrieved 20 September 2015. ^ "Оперативная сводка штаба АТО на 06:00 – 20 cентября" (in Russian). NSDC. 20 September 2015. Retrieved 20 September 2015. ^ "В районе Авдеевки боевики из зенитной установки обстреляли позиции сил АТО". Retrieved 20 September 2015. ^ "Боевики сегодня дважды обстреляли позиции сил АТО – пресс-центр". Retrieved 20 September 2015. ^ a b "За сутки в зоне АТО один военный получил ранения, подорвавшись на растяжке". Retrieved 21 September 2015. ^ "На Луганщине за два дня погиб один военный, двое - ранены". Retrieved 21 September 2015. ^ "За сутки в зоне АТО один военный получил ранения, подорвавшись на растяжке". UNIAN. 21 September 2015. Retrieved 21 September 2015. ^ "На блокпосту в Луганской области погиб украинский военный, еще один был ранен". Information Resistance. 21 September 2015. Retrieved 21 September 2015. ^ "Зведені дані щодо ситуації у зоні АТО – 21 вересня" (in Ukrainian). NSDC. 21 September 2015. Retrieved 21 September 2015. ^ "Сводные данные по ситуации в зоне АТО – 21 cентября" (in Russian). NSDC. 21 September 2015. Retrieved 21 September 2015. ^ "SUMMARY INFORMATION FROM ATO – 21.09.2015 (VIDEO)". NSDC. 21 September 2015. Retrieved 21 September 2015. ^ "При разминировании территории на Луганщине погиб боец 92 бригады". Retrieved 22 September 2015. ^ "Latest from OSCE Special Monitoring Mission (SMM) to Ukraine based on information received as of 21 September 2015". OSCE. 22 September 2015. Retrieved 23 September 2015. ^ "Оперативная сводка штаба АТО на 06:00 – 21 cентября" (in Russian). NSDC. 21 September 2015. Retrieved 21 September 2015. ^ "Украинские военные в зоне АТО сегодня не подвергались обстрелу - штаб". Retrieved 22 September 2015. ^ "Зведені дані щодо ситуації у зоні АТО – 22 вересня" (in Ukrainian). NSDC. 22 September 2015. Retrieved 22 September 2015. ^ "SUMMARY INFORMATION FROM ATO – 22.09.2015 (VIDEO)". URJKN. 22 September 2015. Retrieved 22 September 2015. ^ "Сводные данные по ситуации в зоне АТО – 22 cентября" (in Russian). NSDC. 22 September 2015. Retrieved 23 September 2015. ^ "Боевики трижды нарушили режим тишины близ линии разграничения - штаб". Retrieved 22 September 2015. ^ "Сегодня в зоне АТО случаев применения оружия не было". Retrieved 22 September 2015. ^ "Зведені дані щодо ситуації у зоні АТО – 23 вересня" (in Ukrainian). NSDC. 23 September 2015. Retrieved 23 September 2015. ^ "Сводные данные по ситуации в зоне АТО – 23 cентября" (in Russian). NSDC. 23 September 2015. Retrieved 23 September 2015. ^ "SUMMARY INFORMATION FROM ATO – 23.09.2015 (VIDEO)". NSDC. 23 September 2015. Retrieved 23 September 2015. ^ "Оперативная сводка штаба АТО на 06:00 – 23 cентября" (in Russian). NSDC. 23 September 2015. Retrieved 23 September 2015. ^ "Боевики девять раз нарушили режим тишины, обстреливая позиции сил АТО на артемовском направлении - штаб". Retrieved 23 September 2015. ^ "Зведені дані щодо ситуації у зоні АТО – 24 вересня" (in Ukrainian). NSDC. 24 September 2015. Retrieved 24 September 2015. ^ "Сводные данные по ситуации в зоне АТО – 24 cентября" (in Russian). NSDC. 24 September 2015. Retrieved 24 September 2015. ^ "SUMMARY INFORMATION FROM ATO – 24.09.2015 (VIDEO)". NSDC. 24 September 2015. Retrieved 24 September 2015. ^ "На Донбассе погиб военный - подорвался на мине". Retrieved 24 September 2015. ^ "Оперативная сводка штаба АТО на 06:00 – 24 cентября" (in Russian). NSDC. 24 September 2015. Retrieved 24 September 2015. ^ "Сводка ИС: спецназ ГРУ ГШ ВС РФ завершил ротацию в оккупированных районах Украины". Information Resistance. 24 September 2015. Retrieved 24 September 2015. ^ a b "Ночью боевики обстреляли украинские позиции в Крымском, Зайцево и Красногоровке - штаб". Retrieved 24 September 2015. ^ "Вражеский снайпер в течение часа обстреливал опорный пункт сил АТО в Попасной". Retrieved 24 September 2015. ^ "Погибшая на "танковом биатлоне" в Торезе девочка была дочкой одного из командиров боевиков, - СМИ". Information Resistance. 25 September 2015. Retrieved 28 September 2015. ^ "Operational data from Information Resistance". Information Resistance. 25 September 2015. Retrieved 28 September 2015. ^ "9 Year Old Girl Dies And Many Wounded At Tank Show, Terrorist Attack !". Retrieved 2 October 2015. ^ "Зведені дані щодо ситуації у зоні АТО – 25 вересня" (in Ukrainian). NSDC. 25 September 2015. Retrieved 25 September 2015. ^ "Сводные данные по ситуации в зоне АТО – 25 cентября" (in Russian). NSDC. 25 September 2015. Retrieved 25 September 2015. ^ "SUMMARY INFORMATION FROM ATO – 25.09.2015 (VIDEO)". NSDC. 25 September 2015. Retrieved 25 September 2015. ^ "В Луганской области на "растяжках" погиб военнослужащий, еще шестеро ранены". Retrieved 25 September 2015. ^ "Оперативная сводка штаба АТО на 06:00 – 25 cентября" (in Russian). NSDC. 25 September 2015. Retrieved 25 September 2015. ^ "Оборона Мариуполя зафиксировала вблизи Белосарайской косы эскадру Черноморского флота РФ". Retrieved 25 September 2015. ^ "Боевики на Донбассе пытались втянуть силы АТО в вооруженное противостояние". Retrieved 25 September 2015. ^ "Latest from OSCE Special Monitoring Mission (SMM) to Ukraine based on information received as of 27 September 2015". OSCE Special Monitoring Mission to Ukraine. 28 September 2015. Retrieved 2 October 2015. ^ Zverev, Anton (2 October 2015). "Deadly Russian rocket system spotted in Ukraine for first time". Moscow: Reuters. Retrieved 2 October 2015. ^ "Сводные данные по ситуации в зоне АТО – 26 cентября" (in Ukrainian). NSDC. 26 September 2015. Retrieved 26 September 2015. ^ "Боевики вечером начали обстреливать Артемовское направление, ночью сохранялся режим тишины - штаб". Retrieved 26 September 2015. ^ "Зведені дані щодо ситуації у зоні АТО – 27 вересня" (in Ukrainian). NSDC. 27 September 2015. Retrieved 27 September 2015. ^ a b "Сводные данные по ситуации в зоне АТО – 27 cентября" (in Russian). NSDC. 27 September 2015. Retrieved 27 September 2015. ^ "SUMMARY INFORMATION FROM ATO – 27.09.2015 (VIDEO)". NSDC. 27 September 2015. Retrieved 27 September 2015. ^ "Оперативная сводка штаба АТО на 06:00 – 27 cентября" (in Russian). NSDC. 27 September 2015. Retrieved 27 September 2015. ^ "Ночь в зоне АТО: боевики трижды обстреляли военных на Артемовском направлении". Retrieved 27 September 2015. ^ "Зведені дані щодо ситуації у зоні АТО – 28 вересня" (in Ukrainian). NSDC. 28 September 2015. Retrieved 28 September 2015. ^ "Сводные данные по ситуации в зоне АТО – 28 cентября" (in Russian). NSDC. 28 September 2015. Retrieved 28 September 2015. ^ "SUMMARY INFORMATION FROM ATO – 28.09.2015 (VIDEO)". NSDC. 28 September 2015. Retrieved 28 September 2015. ^ "Оперативная сводка штаба АТО на 06:00 – 28 cентября" (in Russian). NSDC. 28 September 2015. Retrieved 28 September 2015. ^ a b "При обстреле боевиками позиций сил АТО в Марьинке ранены четверо украинских военных". Retrieved 28 September 2015. ^ "Диверсионная группа боевиков с террикона обстреляла позиции сил АТО вблизи Новотроицкого". Retrieved 29 September 2015. ^ "Зведені дані щодо ситуації у зоні АТО – 29 вересня" (in Ukrainian). NSDC. 29 September 2015. Retrieved 29 September 2015. ^ "Сводные данные по ситуации в зоне АТО – 29 cентября" (in Russian). NSDC. 29 September 2015. Retrieved 29 September 2015. ^ "SUMMARY INFORMATION FROM ATO – 29.09.2015 (VIDEO)". NSDC. 29 September 2015. Retrieved 29 September 2015. ^ "В течение суток на Донетчине были ранены двое мирных жителей". Information Resistance. 29 September 2015. Retrieved 29 September 2015.